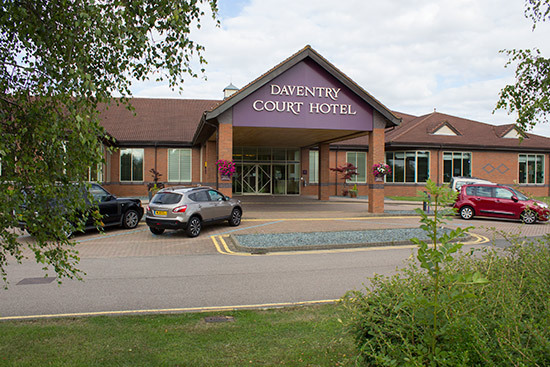 Location: Daventry Court Hotel, Daventry, Northamptonshire, NN11 0SG, UK. 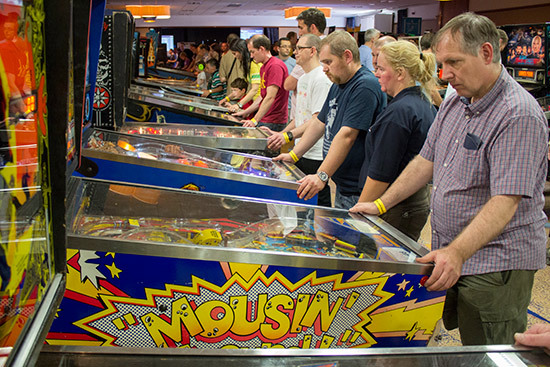 The UK has had a main national pinball show each year since 2005. 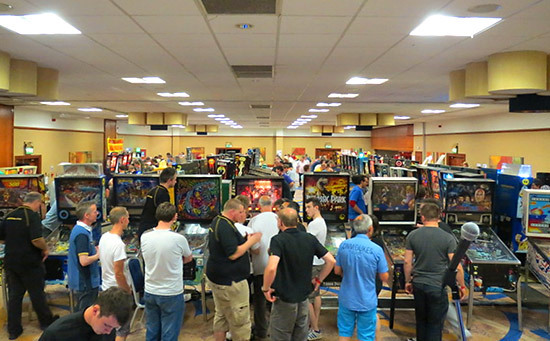 Formerly called the UK Pinball Show, it changed to the UK Pinball Party in 2010 under the stewardship of Andrew Heighway, and has been held at the same venue in Daventry for each of those four years. This is an reasonably upscale hotel, with a pool, sauna, bar, restaurant and outdoor patio area. 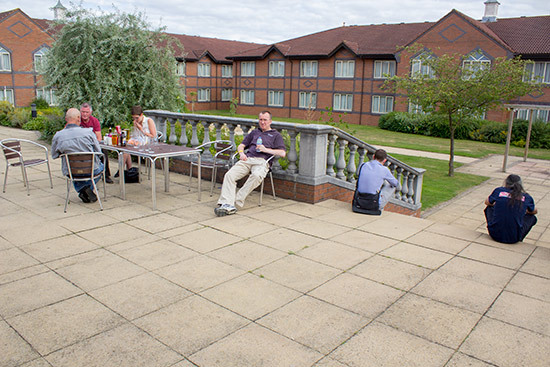 Prices for food and drink were high, although not uncommonly so for a business-grade hotel such as this. Cheaper alternatives were available, and there were a few drinks specials available at the two bars for show visitors. 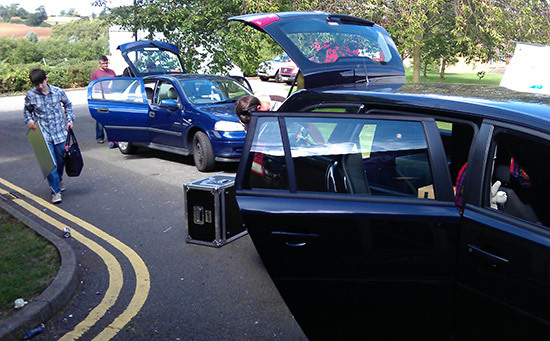 The show runs over two-and-a-half days, starting on Friday evening and continuing until late Sunday afternoon. 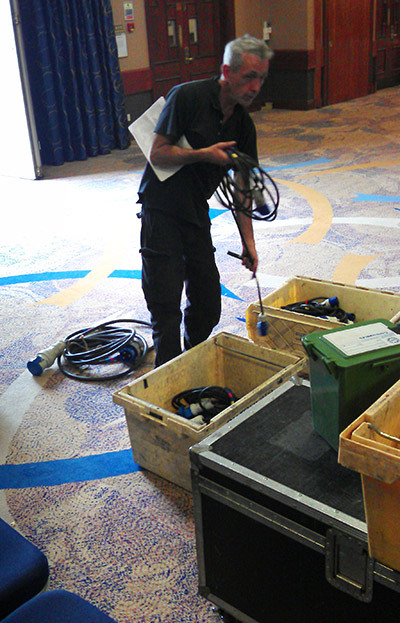 Set-up time is reasonably tight, with machines and equipment arriving throughout Friday afternoon. 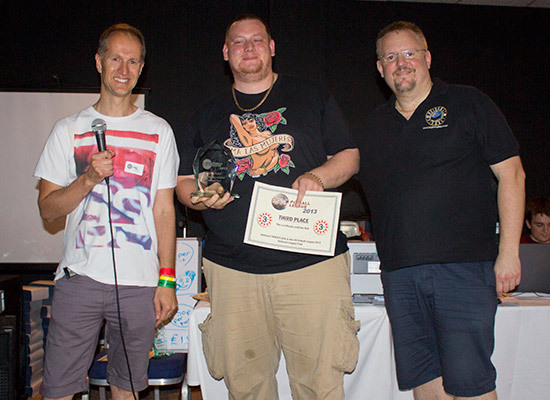 Each year, the UK Pinball Party invites a special guest to attend, mingle with the other guests, sign pinball flyers, translites and memorabilia, and make a presentation at the awards dinner on Saturday night. 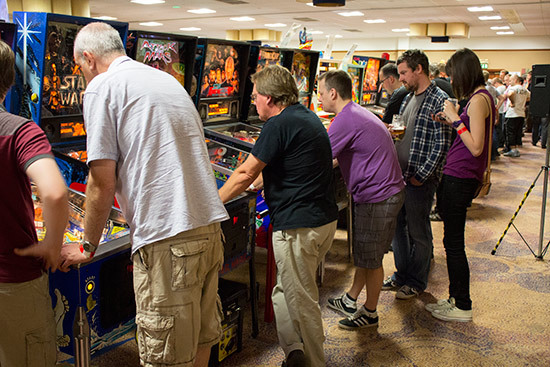 Previous UK Pinball Party visitors have been Dennis Nordman, Jack Guarnieri and Mark Ritchie. 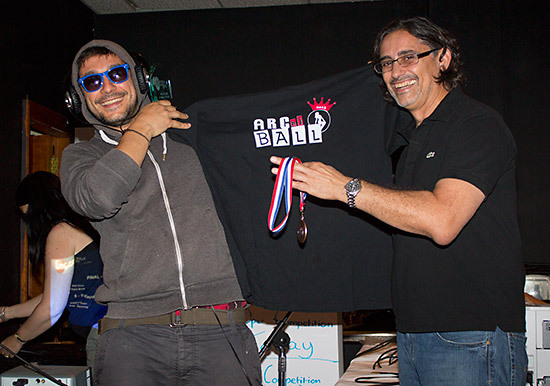 This year, the special guest was Stern Pinball's VP of Product Design, George Gomez. We'll see and hear more from George a little later. The show opened to the public a little after 6pm on Friday. Entry cost £7 ($10.86, €8.19) for Friday evening, £12 ($18.64, €14.05) for Saturday or Sunday, or there was a full show pass covering all three days for £25 ($38.84, €29.28). Tickets could be bought in advance or from the show desk next to the main entrance. Entry was controlled through the use of coloured wristbands, with different colours denoting the various ticket types. 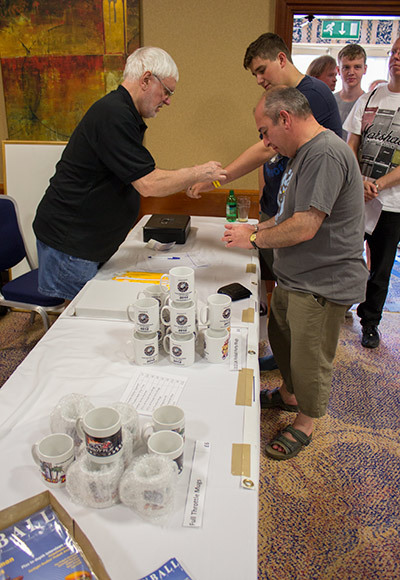 At the show desk, visitors could buy UK Pinball Party mugs, copies of the new Pinball Magazine, as well as a number of promotional items for Heighway Pinball's upcoming Full Throttle game, with members of the team there to answer questions ahead of a special presentation which would be held on Saturday lunchtime. So let's have a look around the show hall. Just along from the show desk on the right hand wall was the Pinball Heaven stand, featuring three of the latest pinball machines: Jersey Jack Pinball's The Wizard of Oz Emerald City Limited Edition, Stern Pinball's Metallica premium and their AC/DC premium. 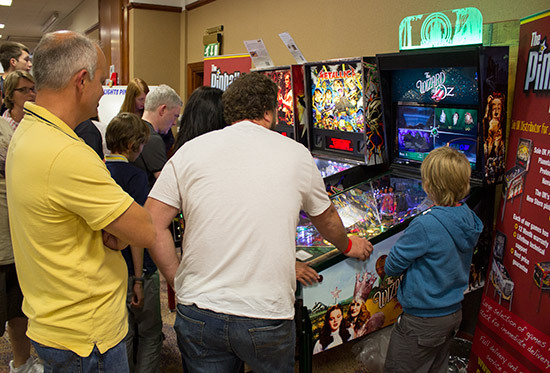 There were queues to play all three throughout the show, while daily high score competitions were held on The Wizard of Oz and Metallica on Saturday and Sunday respectively, with £50 Pinball Heaven vouchers for the winners. 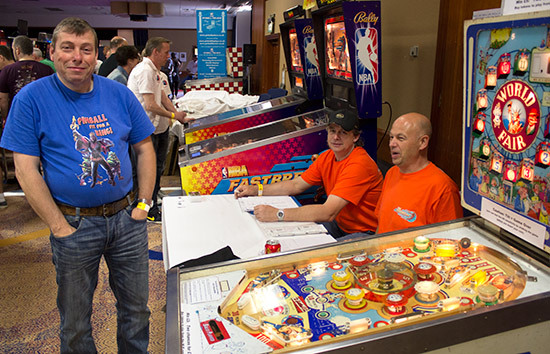 A little further along, the team from Northern Lights Pinball were holding their NBA Challenge head-to-head competition, using a pair of linked NBA Fastbreak machines. Entry cost £10 and was limited to 24 players, each of whom was allocated an NBA team to represent when the competition began on Saturday. Joining the NLP team on their stand was an Elvira look-alike. 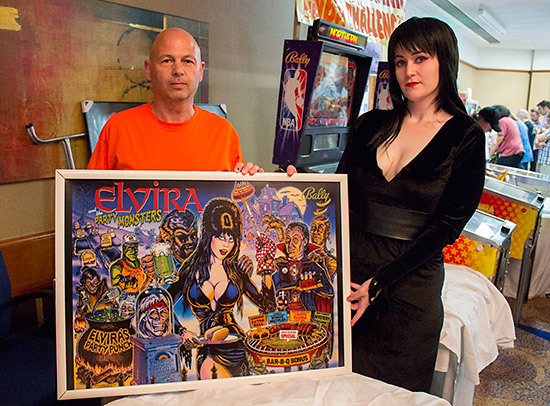 'Elvira' was in attendance to help promote the upcoming Play Expo show being held in Manchester in October, where the NLP team are hoping to expand the range of Cosplay-costumed visitors at the show to embrace the many pinball characters such as Elvira. 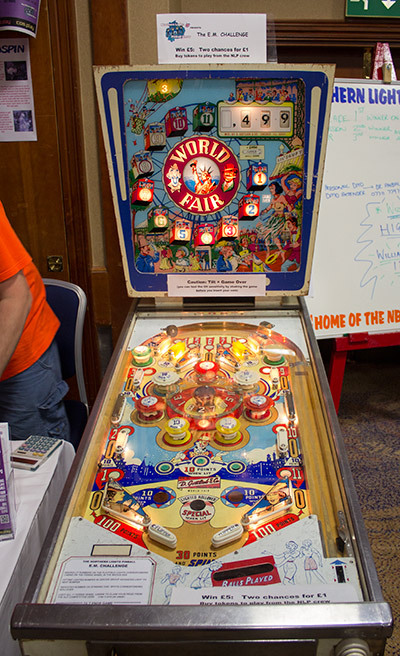 Also on the Northern Lights Pinball stand was a World Fair machine which was used for a second competition, the EM Challenge. The challenge with World Fair was to light all eleven cabins on the backglass. 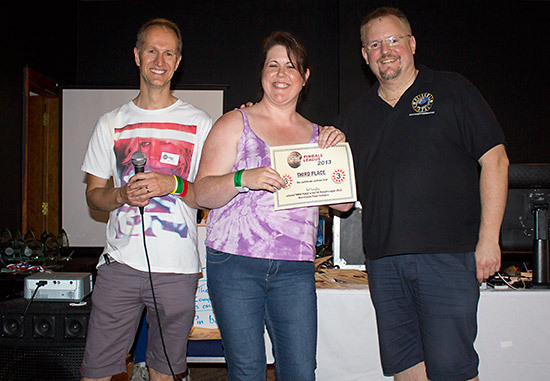 Entry cost £1 for two attempts, and anyone achieving the objective won £5 in cash. 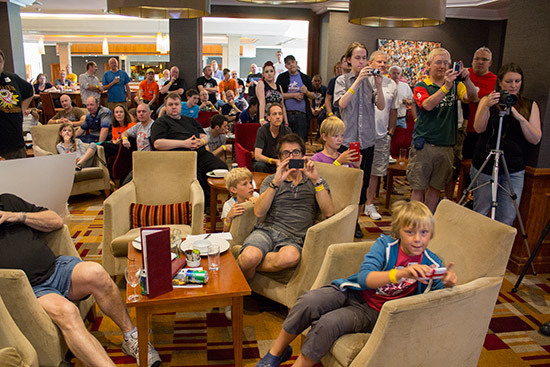 Players could enter as often as they liked but could only with a maximum of £15 over the three days. 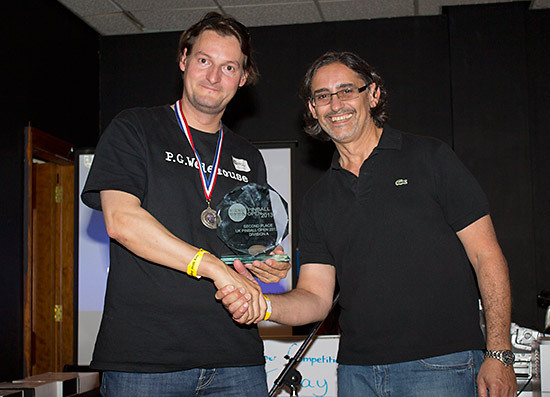 Many players entered the EM Challenge but only six achieved the objective. They were: Dan Wallace (age 10), Lorena Sibson, John Oliver, Nigel Lunt, Mark Potter, and Roger. Continuing towards the back of the hall, we come to Gary Flower's stand. 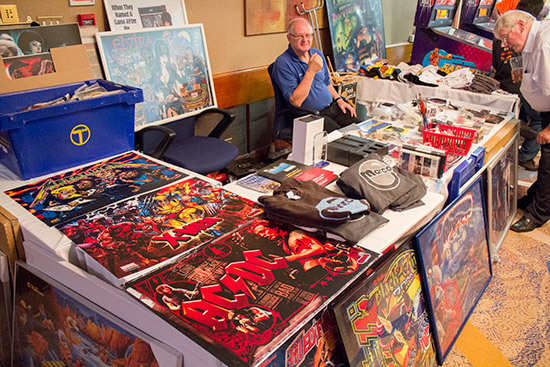 Gary was selling a good selection of translites, posters, T-shirts, pinball parts, manuals, and other assorted promotional items. 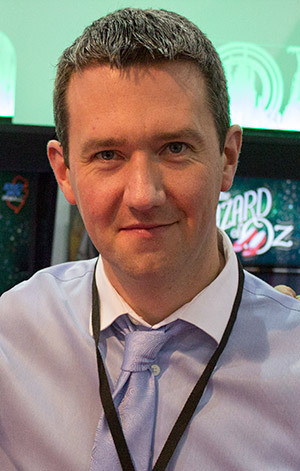 The next stand belonged to Sean Mills, who runs both Pinball Palace and Pinball Wizard magazine. Along with past and current copies of the magazine, Sean had a number of replacement boards on sale, several cleaning solutions from Millwax, and was demonstrating the latest release from ColorDMD. Adjacent to Sean was Jon Melleney's 1 Stop Pinball stand. 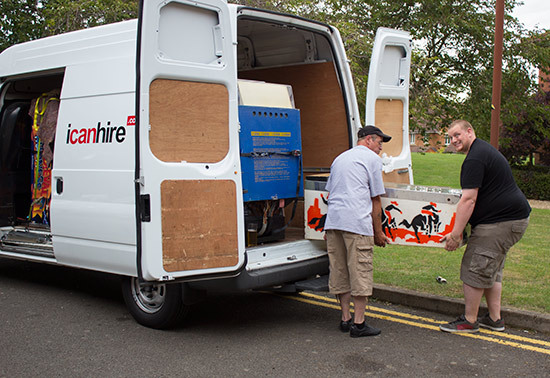 Although Jon's speciality is LEDs, his range has expanded to include pinball rubbers, sundry cabinet parts and cleaning products from Treasure Cove. 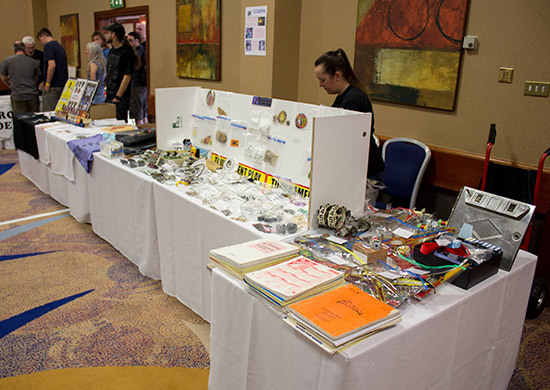 Continuing with the vendors at the show, at the front of the hall were three more stands. 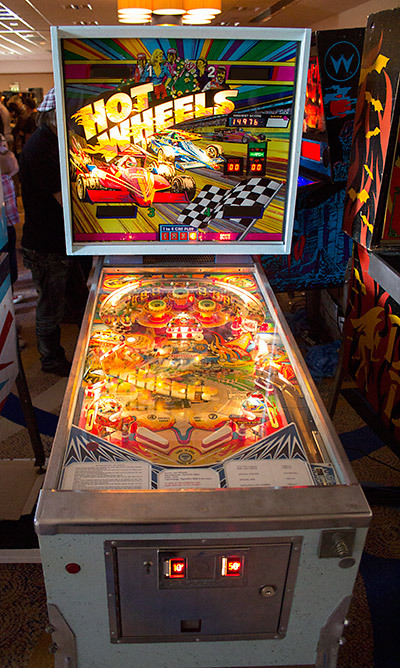 The largest of these belonged to Andy Netherwood's Pinball Mania. 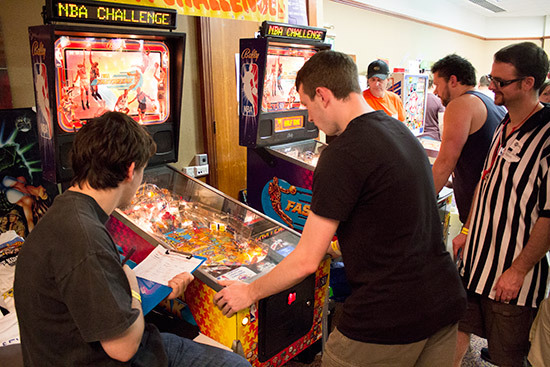 The Pinball Mania stand carried a expansive range of essential pinball parts, assorted mods, and numerous electronic components. As well as running the stand, Andy was also the main tech for the show, often found with his head inside a pinball cabinet or backbox. 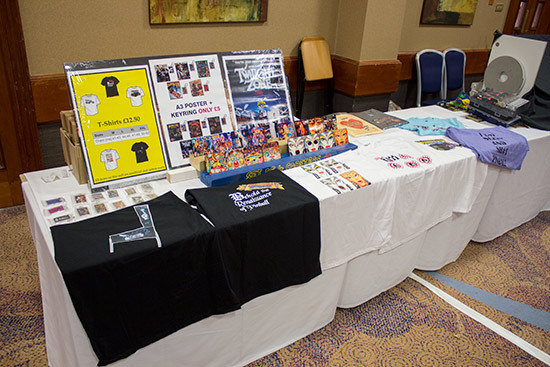 Facing Pinball Mania was a stand selling various pinball-related T-shirts, coasters, posters and key fobs. 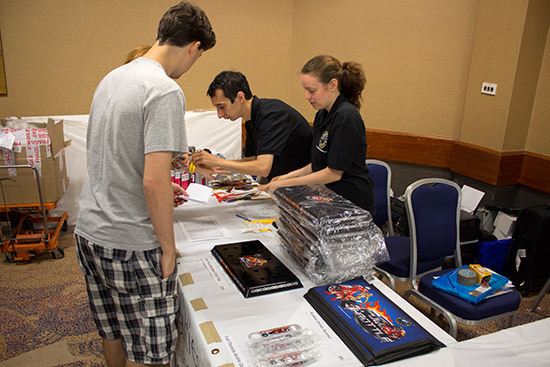 Although a selection of products were on show and available to purchase, specific games or custom designs were also available to order. 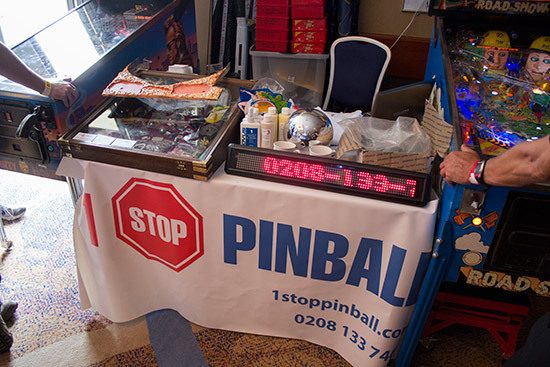 Next door was Dave Willcox's Pinball Daze stand. 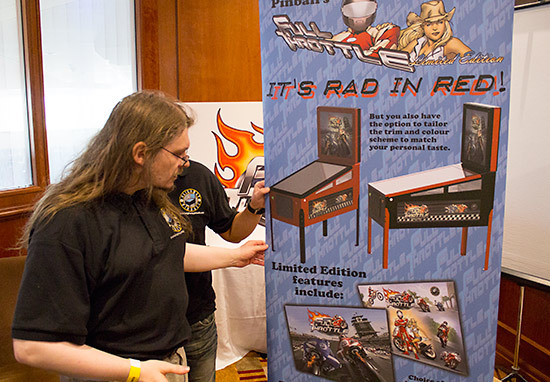 The stand featured a mix of new and reclaimed pinball parts, such as manuals, plastic sets, drop targets, coils and flipper mechanisms. 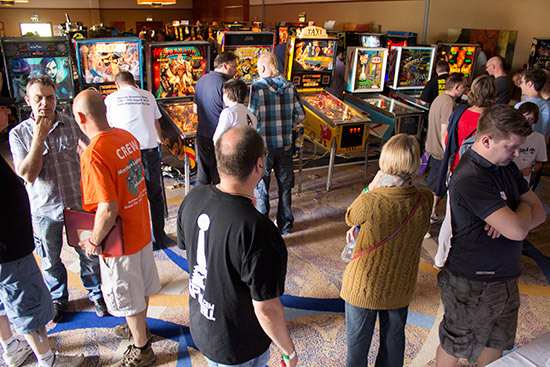 The centre of the hall was where all the pinball machines were located, arranged in two long rows of back-to-back games. In a welcome change from previous years, a gap was introduced at the end of the central corridor, allowing guests to exit the area without having to retrace their steps. 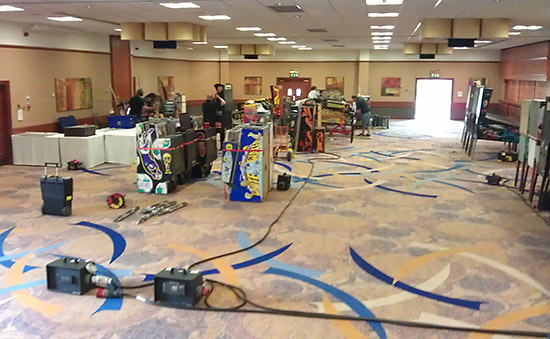 Something else commented upon by many visitors was the good variety of machines available to play. 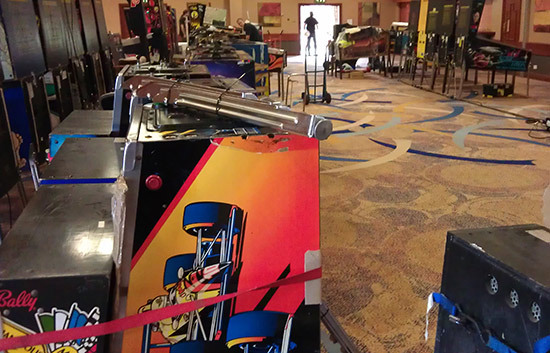 For instance, the row on the right of the hall contained a grouping of Gottlieb/Premier machines - Black Hole, Haunted House, Devil's Dare, Class of 1812, TX Sector, Gold Wings, Volcano, Surf 'n Safari and Frank Thomas' Big Hurt - which was especially appreciated and opened many people's eyes to these hidden gems. 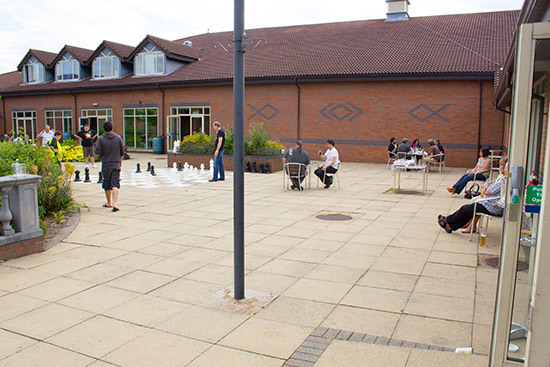 At the rear of the hall was the tournament area, where the main competitive events were held across all three days. 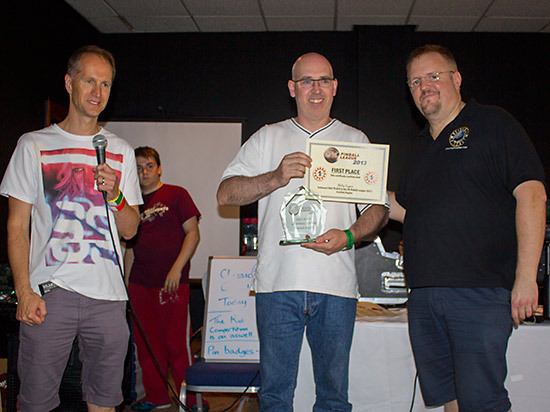 There were six tournaments in all - the UK Pinball Team Tournament, the UK Pinball Open, the UK Pinball Classic, the UK Pinball League final and two UK Pinball Kids Tournaments (one on Saturday, and a second one on Sunday). The tournament desk was positioned on the stage, giving the team - headed by Dawn Raison - a good overview of the tournament arena. 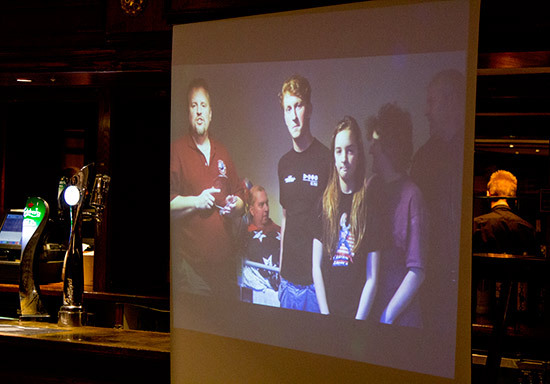 Projector screens on either side of the desk showed the overall positions in the current tournament, and a break-down of the individual machine scores or player points. 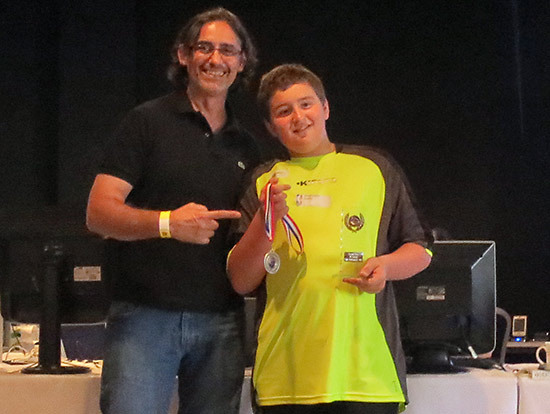 An additional monitor on the desk in front of the stage also provided detailed information about players' performances, while another to the right of the stage showed the scores in the Kids Tournaments. 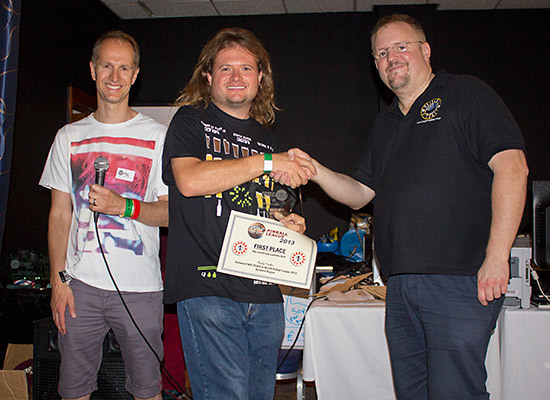 The first of the tournaments was held on Friday evening and was the UK Pinball Team Tournament, run by Matt Vince. 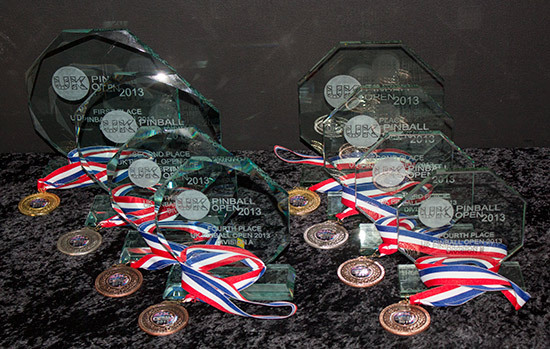 Sixteen teams of four players competed in the initial qualifying round, where groups of four teams played in a mini-league, playing 2-player 4-ball matches against each other with each team member playing one ball. The winner of each match earned 5 points, the loser 0 points. 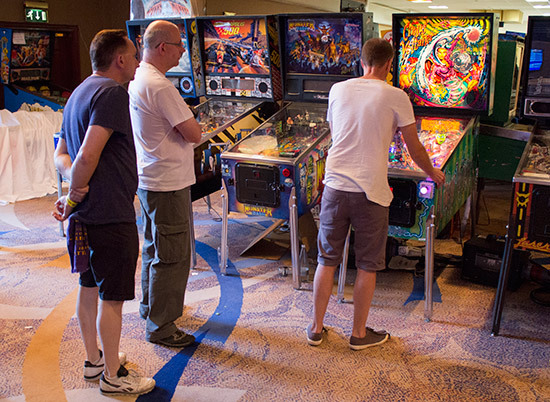 After playing their three matches against the other teams in their group, teams then had to play a single-player 4-ball game on one of two 'bonus' machines - Jackbot or X-Men - with each player again having just one of the four balls. All four teams in the group were ranked with the highest scorer earning 9 points, the second highest 5 points and the third highest 2 points. 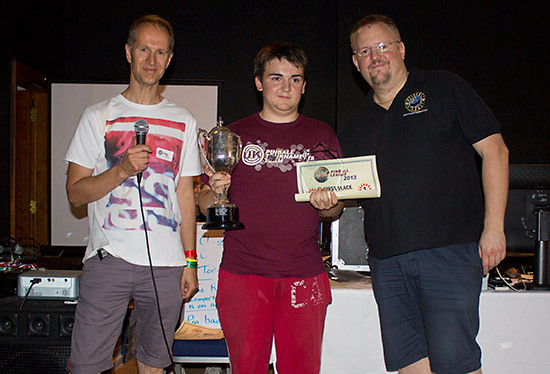 In an exciting and close final on Laser War, it was a repeat victory for Surrey Pinball who also won the tournament last year. In second place were the Yorkshire Puddings, followed by The Dorset Double Dangers, with A Load of Balls in fourth. 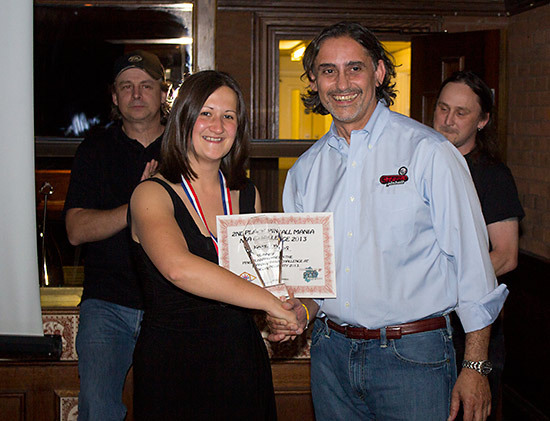 The awards were presented by George Gomez. 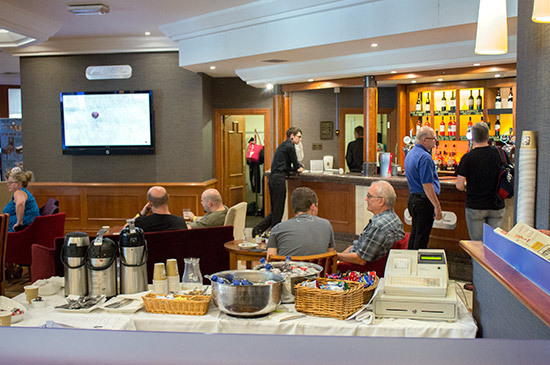 The doors opened on Saturday morning around 30 minutes after the scheduled 9am start time, due to a fault in the hotel's power distribution wiring which was diagnosed and fixed by John Higgins and his team. Thereafter, there were no problems with the power for the rest of the show. 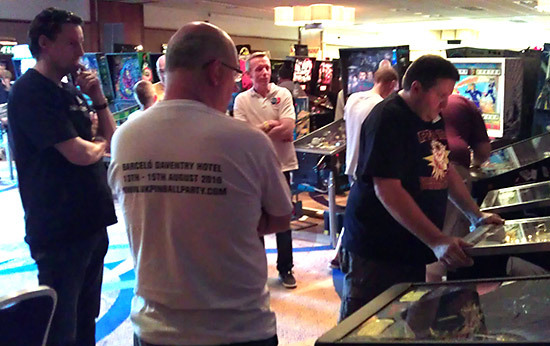 The main tournament of the weekend was the UK Pinball Open which also began slightly late for the same reason. 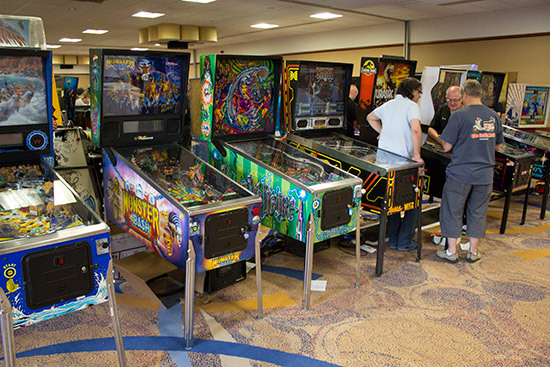 The line-up of machines was unchanged from the previous day's Team Tournament, although they had been switched over to 3-ball play and any faults repaired. Peter Blakemore was heading up the team running this event, with an army of volunteers to take scores and sort out any problems with the games (or the players). 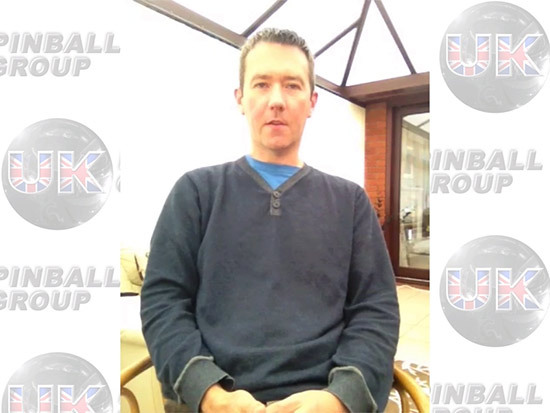 This year produced a record field for the Open, with a total of 131 players taking part. 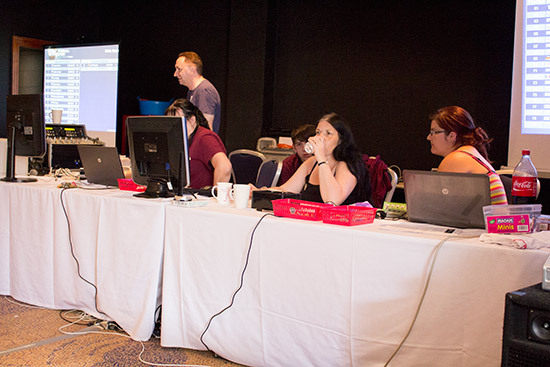 The vast majority pre-registered through the tournaments website, but a few last-minute places were made available on the day. There was a good showing from France and Netherlands, along with players from Belgium, Germany, Switzerland and Sweden all taking part. 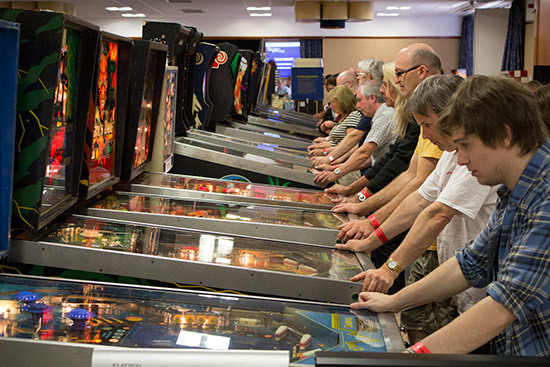 Competitors had to play a single game on any six of the fourteen machines available. 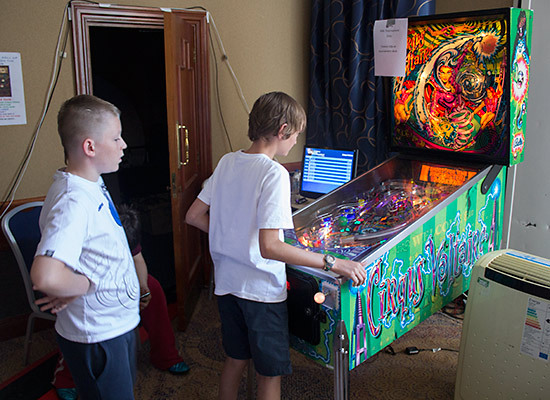 All scores on each machine were ranked and ranking points awarded, with 100 points for the top score and a descending scale for lower positions. 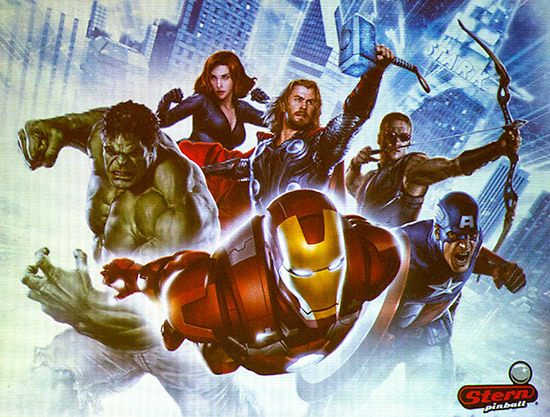 A player's total score was the sum of their ranking points across all six machines. To prevent a single bad game unbalancing their score, each competitor had a 'joker' ticket they could use to replay a machine of their choice. They could also choose one of three qualifying periods during which to play their qualification games: 10am-12pm, 12pm-2pm and 2pm-4pm. 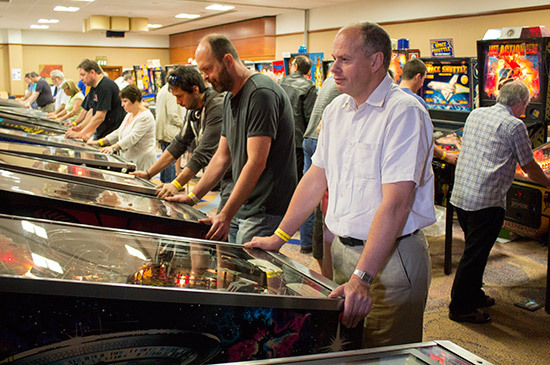 In practice there was a relaxed approach to when games were played which was just as well, as queues built up on the more popular machines, and there were several other events for competitors to also enjoy during the day. 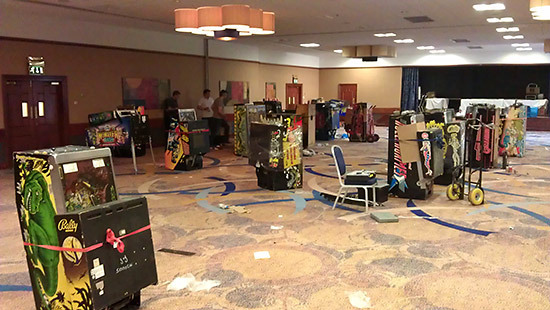 Preparations for one of these were underway in the hotel's lobby area, where a special presentation by the Heighway Pinball team took place at 1:30pm. 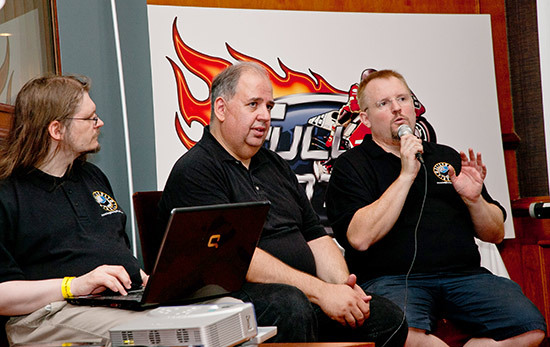 The event was held to unveil the latest prototype of the company's Full Throttle machine and was introduced by Pinball News Editor, Martin Ayub, who asked Andrew Heighway to tell the audience how the game had changed since they first unveiled it a year ago, how much work still remained to be completed, and about the new members of the Heighway Pinball team. 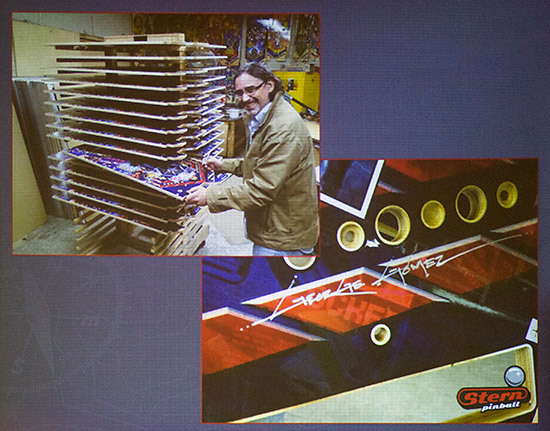 You will be able to see a special interview with Andrew all about Full Throttle shortly here in Pinball News, but he revealed that following customer feedback, the game's artwork package had been redesigned by renowned pinball artist Doug Watson. 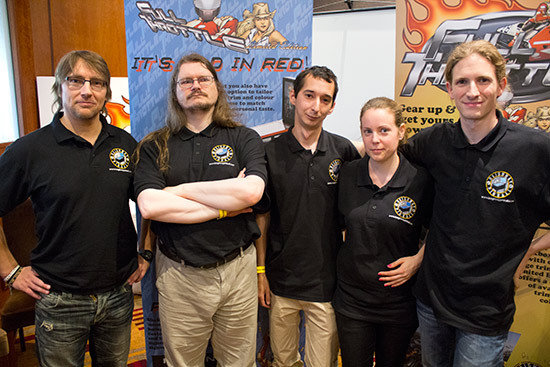 And Doug wasn't the only well-known addition to the team, as game designer Dennis Nordman will be designing the company's third game. John Trudeau has also completed a design for the company and this game will appear after Dennis's title. 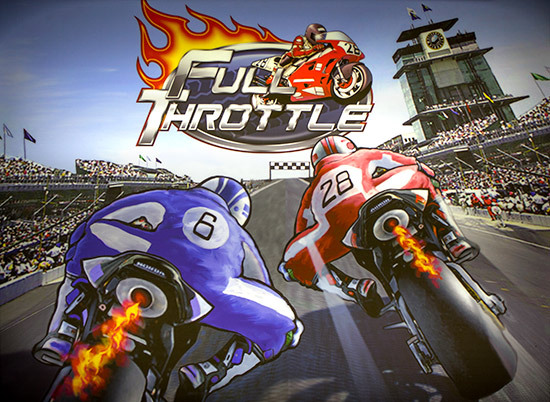 But the centrepiece of the presentation was the Full Throttle prototype which Andrew then unveiled. 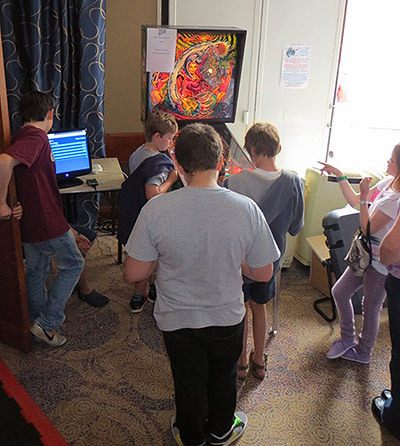 Guests were then invited to come and play the game, which had a fully flipable playfield, a skill shot and a number of rules implemented, although the software was still at an early stage of development. The cabinet shown here is not the intended design, which didn't quite make it in time for the show, but game designer Dave Sanders showed us some renderings of the final design and some of the trim options available on one of the event banners. 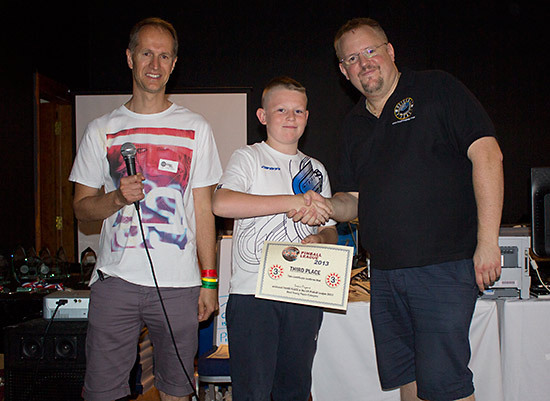 After the Heighway Pinball presentation, the play-offs in the NBA Fastbreak tournament took place, alongside the final session of qualification for the UK Pinball Open, and Saturday's edition of the UK Pinball Kids Tournament which was being contested on an Indianapolis 500 machine at the edge of the tournament area. The Open qualification round finished just before 5pm with all but three people playing their full quota of six games. The top 24 qualifiers went into the A division, and the next 16 into the B division. However, the B division was not open to the top 250 IFPA-ranked players or those who had won a major tournament or league final. As the Open qualifying came to an end, so did the Saturday's Kids Tournament. 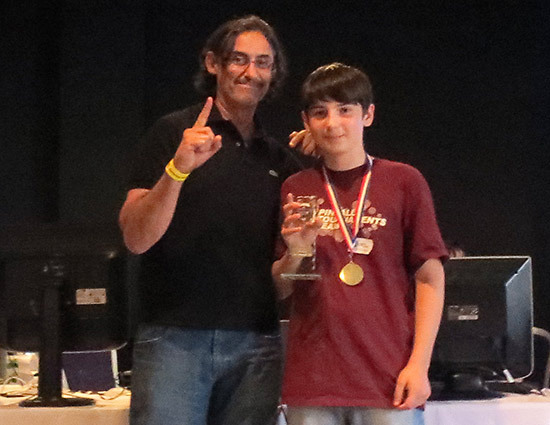 This was a straight high score competition where players could enter as many times as they liked to try to secure one of the top scores. Each entry cost £0.50 ($0.77, €0.59). 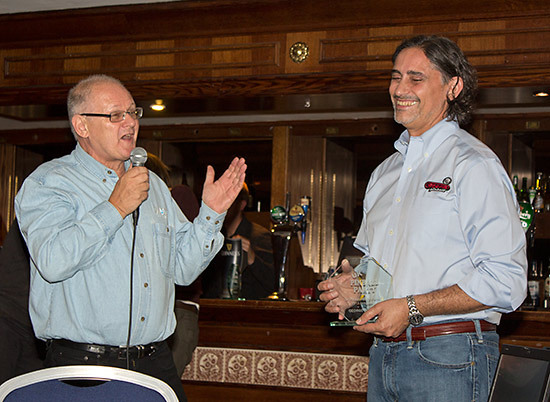 The awards were presented soon after by George Gomez. 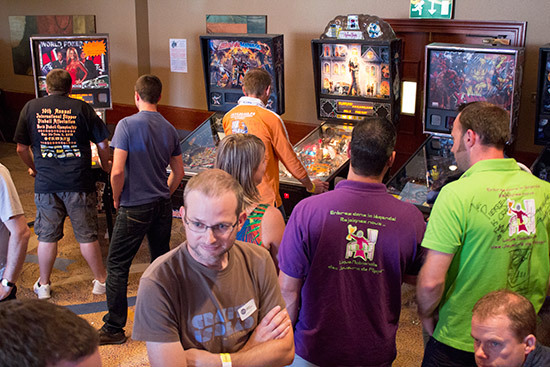 Before we move on to the play-off for the Open, now would be a good time to see the UK Pinball Party for yourself with our exclusive Four Minute Tour. Take a walk around the show floor, seeing all the games, the vendors, the tournament area and much more. 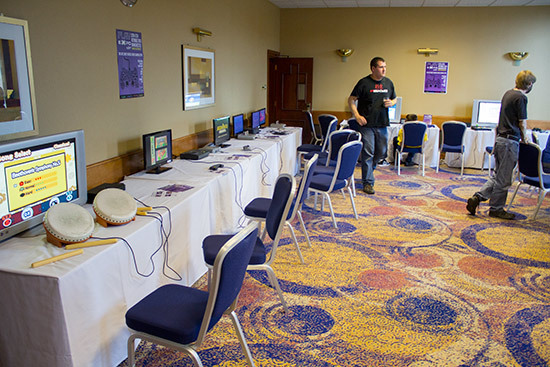 Apart from the games in the hall, there was also an exhibit in an adjacent room from Replay Events, who brought along a number of video stations - including many video pinball games. 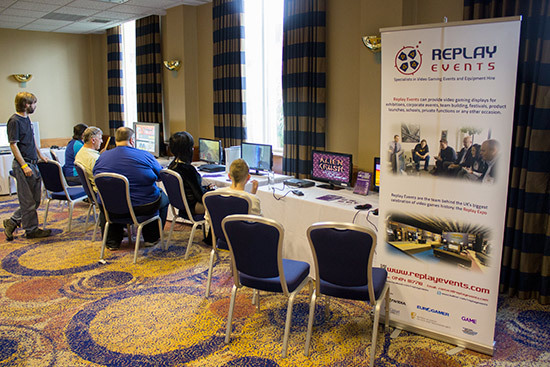 Replay Events set up video gaming displays for corporate and social events, and will be exhibiting at Play Expo in October. 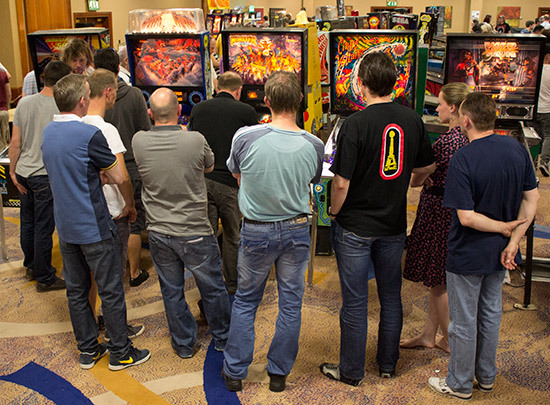 Back in the main hall, the 40 UK Pinball Open qualifiers were now split into two divisions - A & B. The top 24 players were in A and the next 16 eligible players were in B. Because the B division had entry restrictions, it didn't qualify for WPPR points on its own, but players still earned points based on their qualifying position. 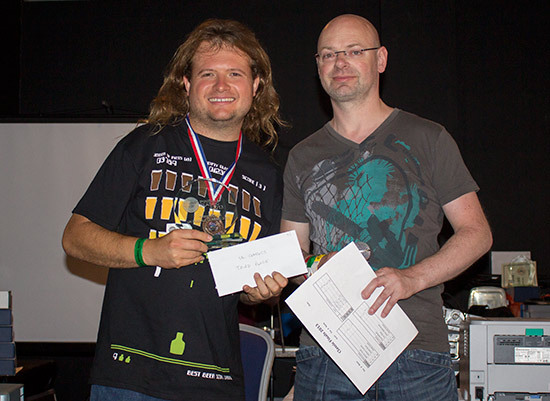 Both divisions awarded trophies and medals to the top four players, with A also earning the winners cash prizes of up to £300 ($470, €350). For the A division players, another four rounds of qualification awaited. 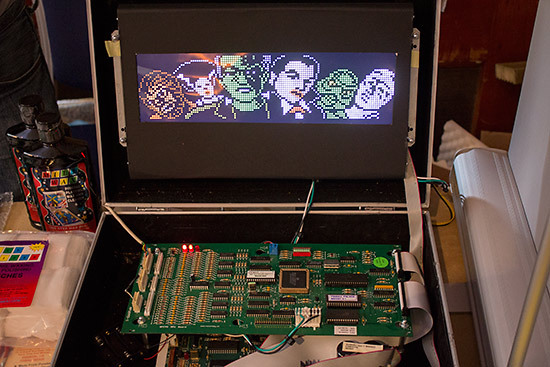 Players were paired up and played together on predetermined machines. They did this four times, changing machines and playing partners each time. When all four rounds were over, the scores on all the machines were ranked and ranking points awarded as in the first qualification round. This time, only the top 8 players from the 24 would move on to the semi-finals. 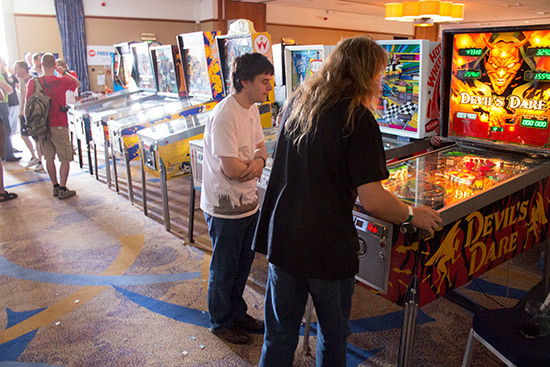 For the sixteen B division players, their first round of play-offs consisted of four 4-player games on the two machines of the fourteen machines not being used by the A division - X-Men and Jackbot. The top 2 from each group of 4 moved on to the semi-finals. The two A division semi-finals were contested on The Addams Family and Combat. Players ranked 1st, 3rd, 5th & 7th in the play-offs played The Addams Family, while those placed 2nd, 4th, 6th and 8th got Combat. Franck Bona was an easy winner on The Addams Family with a score of 286M. 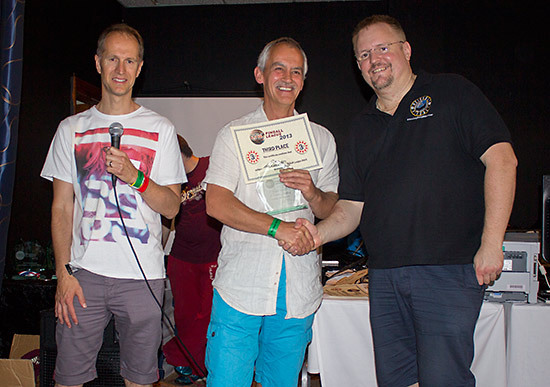 Paul Jongma was second on 36M, with Peter Blakemore third on 20M and Adrian Donati fourth on 17M. Over on the Combat there was another runaway winner, as Matt Vince racked up a comfortable 189K. 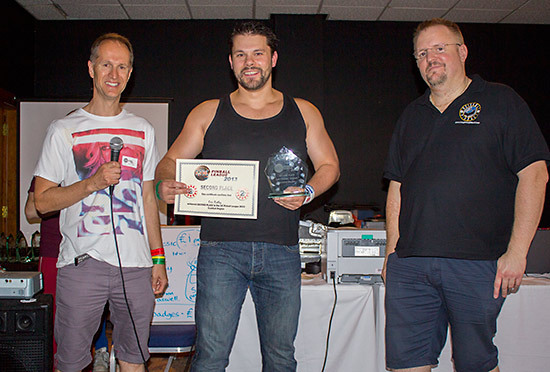 Second place went to Nicolas Tarchiani on 70K, closely followed by Albert Nomden on 65K and Greg Mott on 51K. 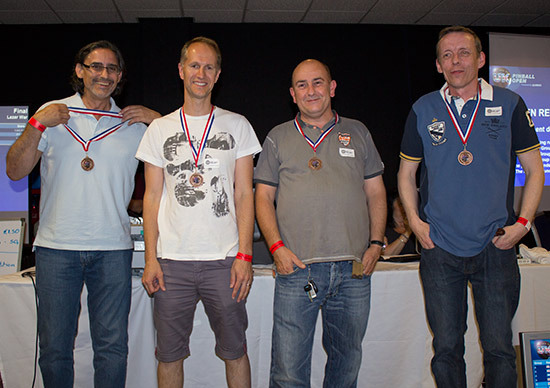 So the A division final would be contested by Franck, Paul, Matt and Nicolas on a machine drawn at random - Jackbot. Matt Vince began the final. By the end of ball two, Paul Jongma had drawn out a decent lead with a score of 678M, with Franck back on 370M, Matt close behind on 300M and Nicolas still in contention on 200M. But Jackbot is a game where a good multiball can produce hundred of millions of points very quickly, and so it proved on the last ball. Matt boosted his score up to 629M - not enough to take the lead but putting him temporarily in second place. Franck took charge and tripled his score to give him the lead with 1.043B. Nicolas wasn't able to overhaul Matt's score, leaving him in fourth place and meaning only Paul was in with a chance of beating Franck's score. Needing 415M on his final ball, an early drain put paid to his hopes of winning, but gave him second place. Meanwhile, the 5th-8th place play-off took place on the other side of the tournament area on Cirqus Voltaire. This provided a fairly easy win for Peter Blakemore whose 24.19M almost doubled Albert Nomden's score of 13.28M. Greg Mott was close behind on 11.35M while Adrian Donati's 8.46M gave him 8th overall. 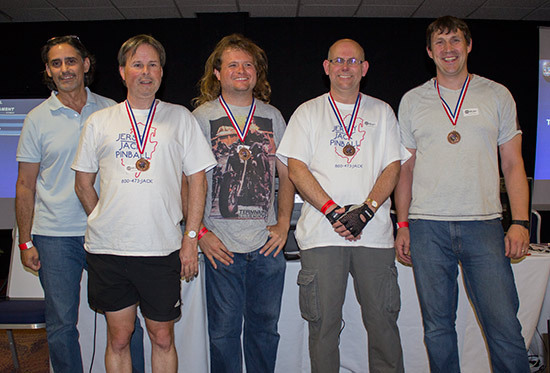 In the B division, the two semi-finals on Jackbot and X-Men both produced clear winners, with Christophe Wozniac and Lewis Fryars both going into the final, where they were joined by Neil Fellender and Alex Hooper. 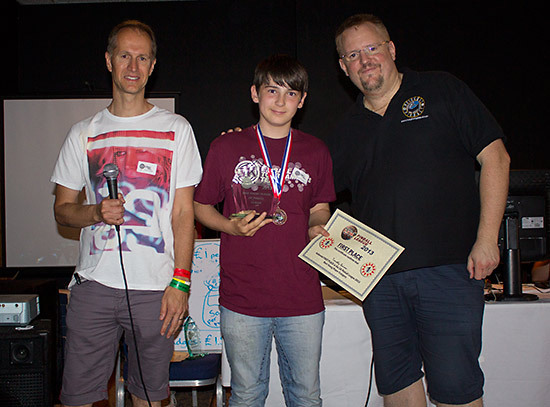 In the B division final it was an emphatic win for Alex hooper, whose 220M score was well ahead of Christophe Wozniac's 133M. 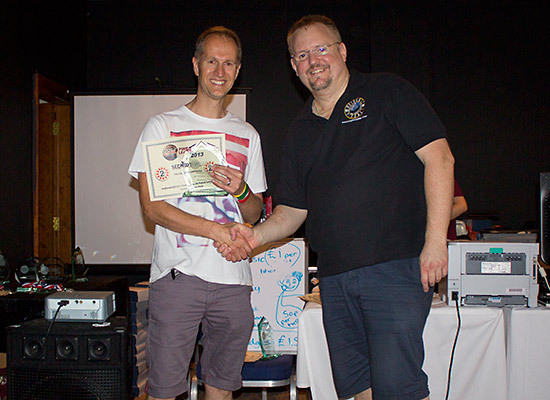 Third place went to Neil Fellender on 117M, with Lewis Fryars in fourth on 38M. 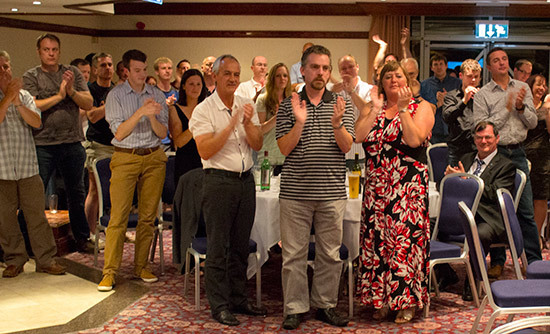 The presentation of the trophies, medals and cash prizes then followed. 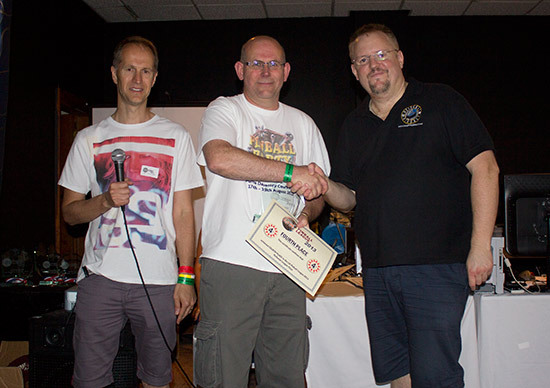 The presentation of the prizes to the winners in the UK Pinball Open heralded the closing of the hall in preparation for the awards dinner to be held downstairs in the CATS suite. Entry cost £40 ($62.58/€46.87), which included a three-course meal. In-line with bookings for the hotel and advance ticket sales for the show, the number of places reserved for the dinner was up about 40% on last year, extending the dining area onto the dance floor. 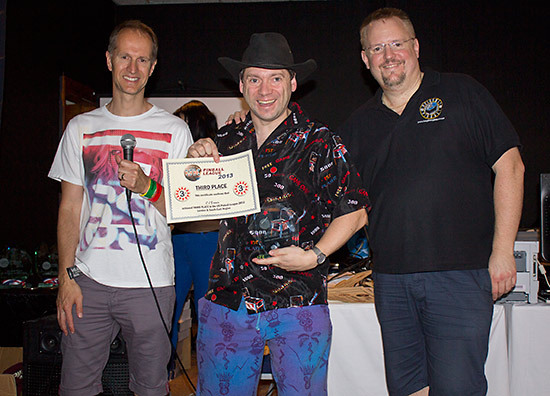 UK Pinball Party organiser Andrew Heighway welcomed guests and, once dinner had been eaten, made an extended series of 'thank you's to all those who made the show possible. 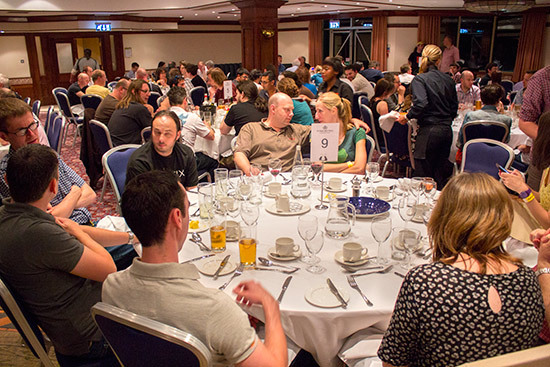 This was an awards dinner, and the first awards were given to the latest inductees to the UK Pinball Group Hall of Fame. This evening, three new members would be joining them. 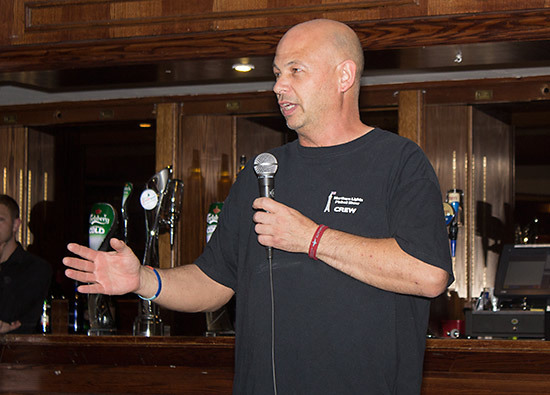 The first new inductee was unanimously agreed by the committee back in February and his induction brought forward when it became clear he was seriously ill and unlikely to be at this year's dinner to collect his award. 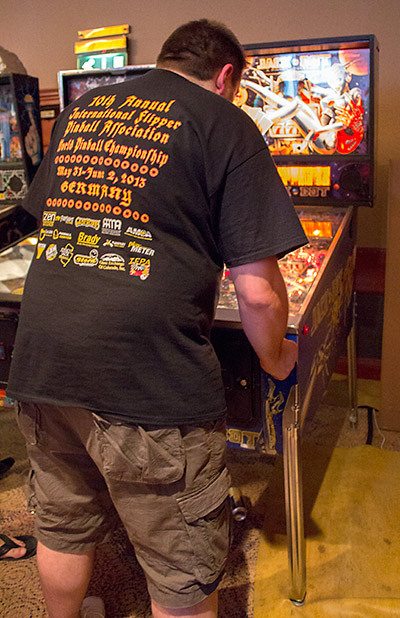 Dave Rolfe had a huge passion for pinball, especially Bally machines from the '80s. 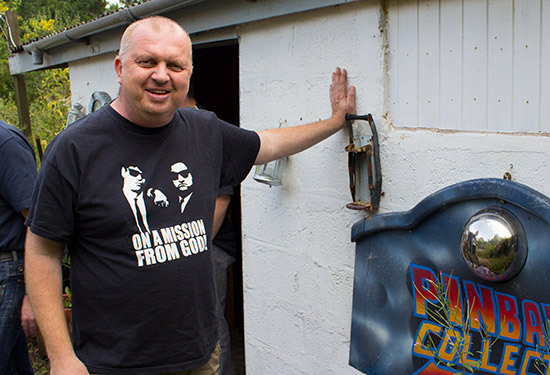 He and Elaine hosted the annual Welsh Pinball Classic for several years, opening up their family home at Ochran Mill in South Wales to create a week-long party leading up to the main tournament. 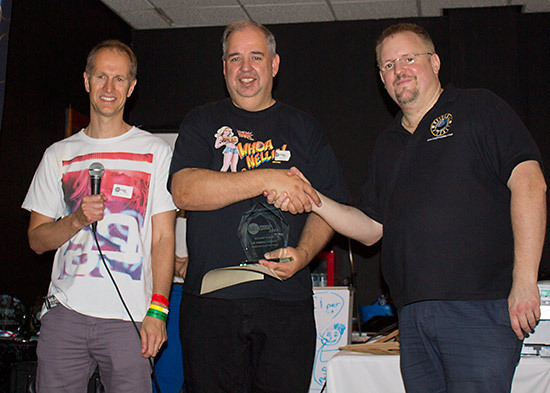 Dave also created the first Welsh PinGolf tournament, while his enthusiasm and generosity brought in numerous new members to the UK's pinball community. Andrew Heighway visited Dave during his final days, and presented him with his Hall of Fame induction award. His son Harry made an acceptance speech on his behalf, and the ceremony was shown to the audience at the dinner. 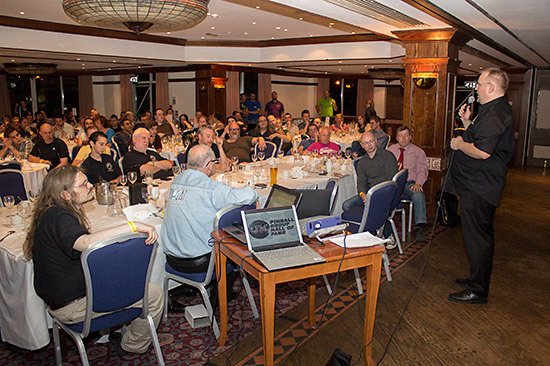 His passing on March 16th left a huge gap in the fabric of pinball in the UK, and as a demonstration of the esteem in which continues to be held, the guests at the awards dinner gave him a rousing thirty second standing ovation. 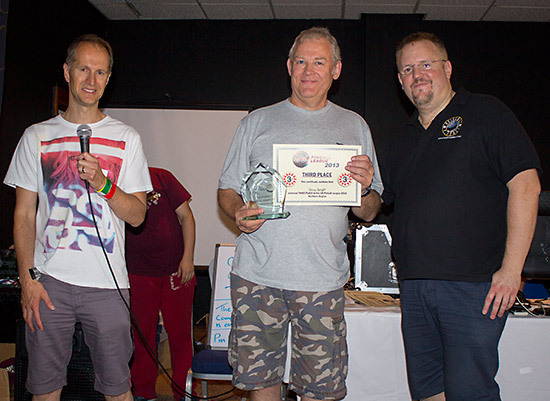 The second new member of the UK Pinball Hall of fame has been involved with pinball for twenty years, ever since he began by restoring an electromechanical machine in his family shed. Soon the number of machine restorations increased, and a custom-build shed to house his work was constructed. 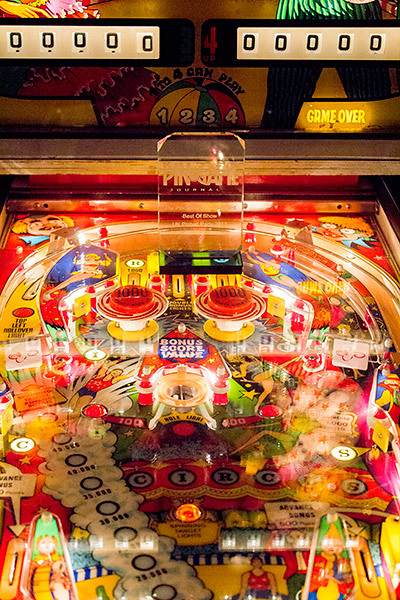 As the workload increased, he bought a shop and found a name for the business: Pinball Heaven. 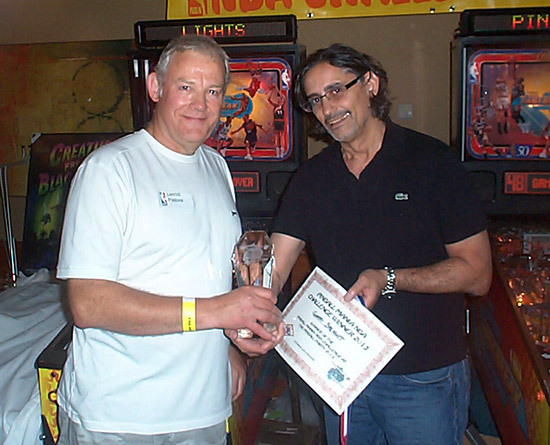 Since then, Phil Palmer has become known the world over as a restorer, seller of new machines to the retail market, the UK importer and distributor for Jersey Jack Pinball machines, and the biggest seller of Stern Pinball machines to the home. He also sells a wide range of parts, and is responsible for a dozens of previously-unavailable parts now being on the market. 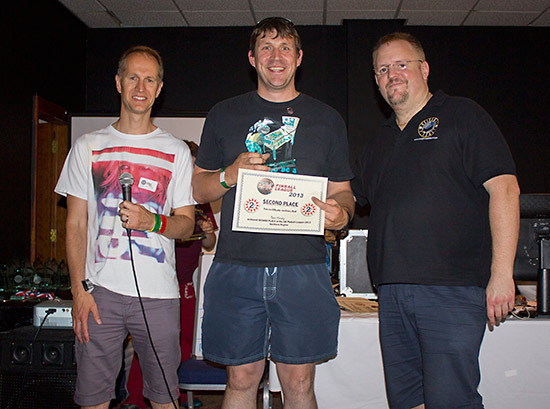 Phil sent the latest games from JJP and Stern to the UK Pinball Party, and supplied prizes for the high score tournaments, as he has at many other pinball events. In recognition of all this, Martin Ayub introduced Phil as the next inductee into the Hall of Fame. 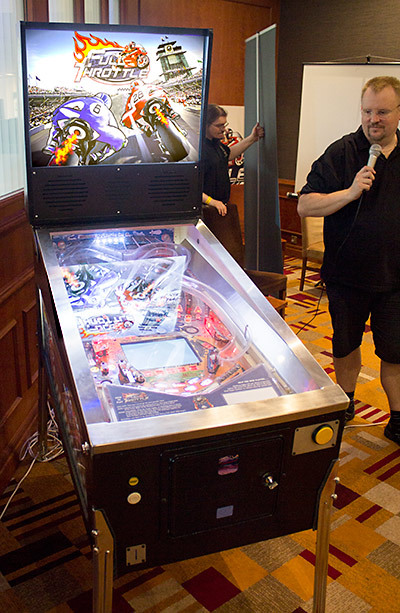 Phil was not able to be at the show as he was on holiday at the time, but he did record a video message expressing his thanks to everyone for his nomination and saying what an exciting time it currently is for pinball with so many new manufacturers and games being produced. 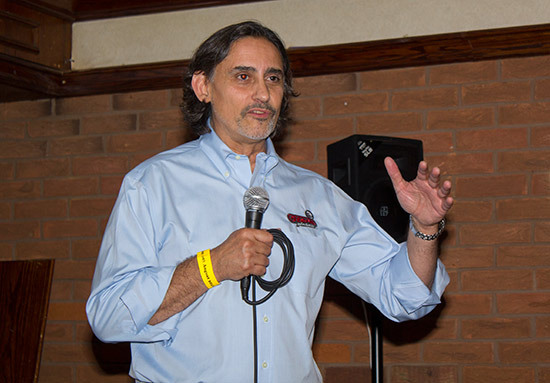 The third and final inductee for 2013 needed little in the way of introduction, but for those unfamiliar with the range of products he had designed, Gary Flower gave a brief summary of the career of George Gomez, before presenting him with his award. 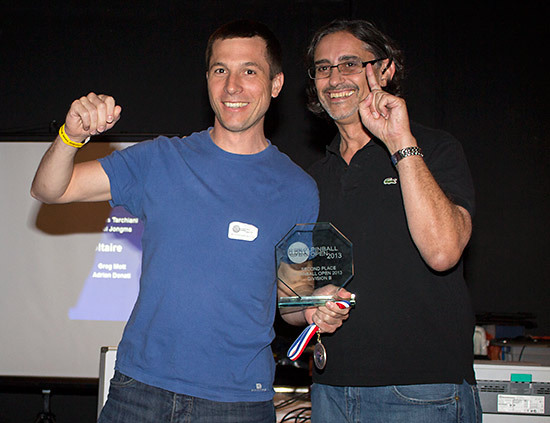 George would shortly give a talk about some of the games he designed at Midway, Williams and Stern, but first there were a few more awards to be presented. 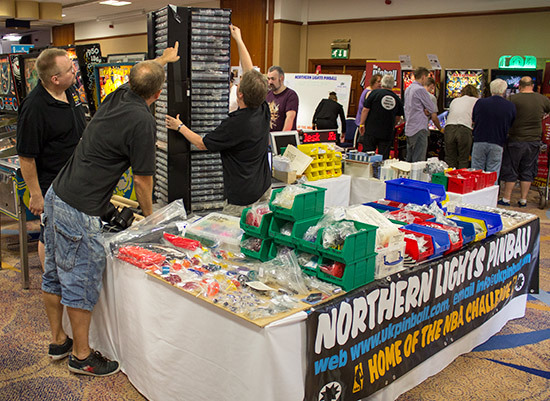 Mark Robinson of the Northern Lights Pinball team spoke about the forthcoming Play Expo show in Manchester this October, where the NLP display will have 100 machines set up for visitors to enjoy. 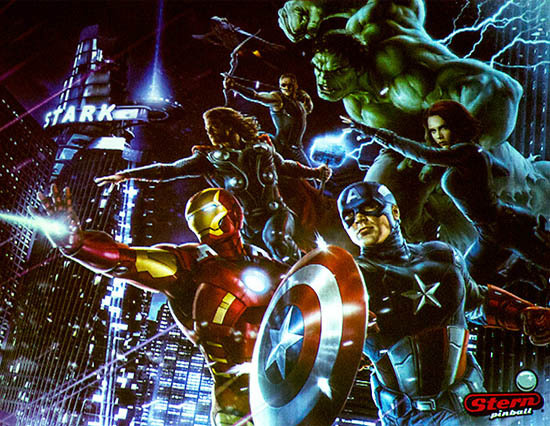 Most of these will be non-pinball people, so this is a unique chance to introduce (or re-introduce) the game to a receptive gaming audience. 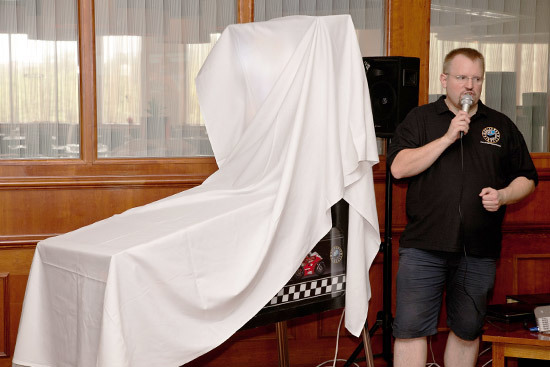 Mark invited everyone to come to the show and to bring a machine if possible, or to dress up as their favourite pinball character for their PinCos feature. 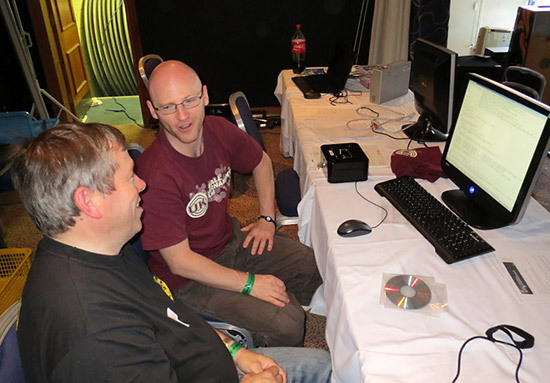 Discounted Play Expo advance tickets are available from the NLP website. The NLP crew then awarded the prizes in the NBA Challenge tournament held earlier in the day. 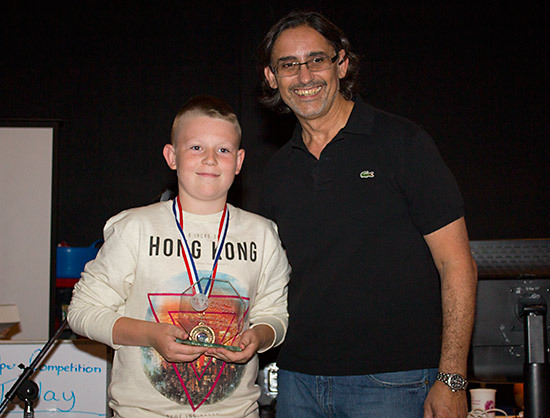 The winner of the competition could not be at the dinner, so Garry Speight was given his trophy by George immediately after the final. 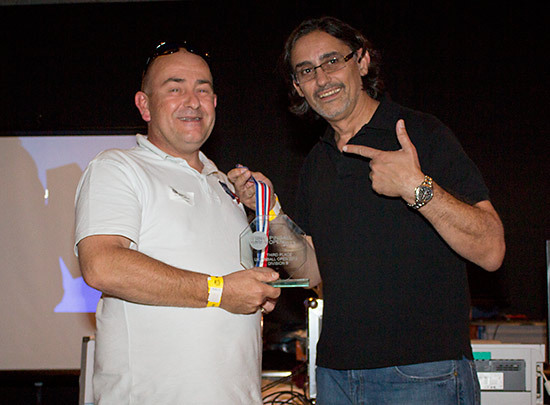 Andrew Heighway then presented a number of awards for the best machines at the show in several different categories. 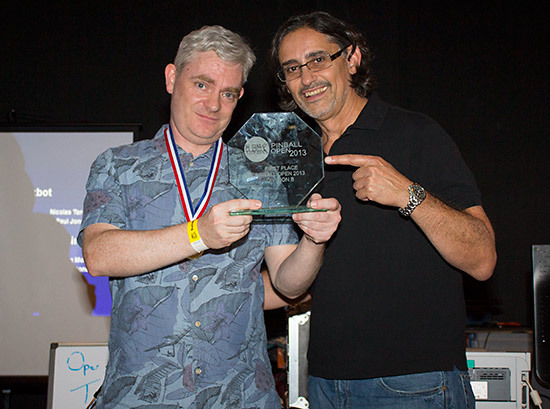 Gary then presented the Best in Show award, sponsored by Pingame Journal, to John Bateson's beautifully restored Zaccaria Circus. 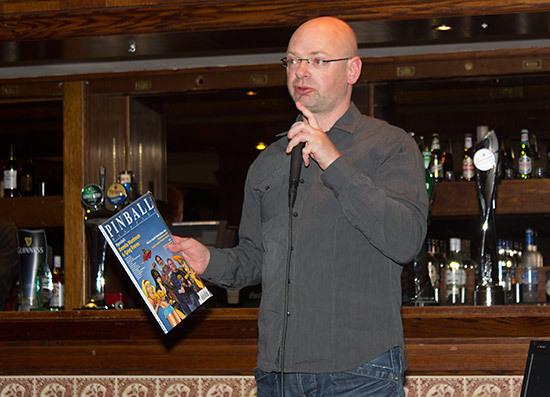 One year ago, the UK Pinball Party was the venue for the launch of the first issue of Pinball Magazine. 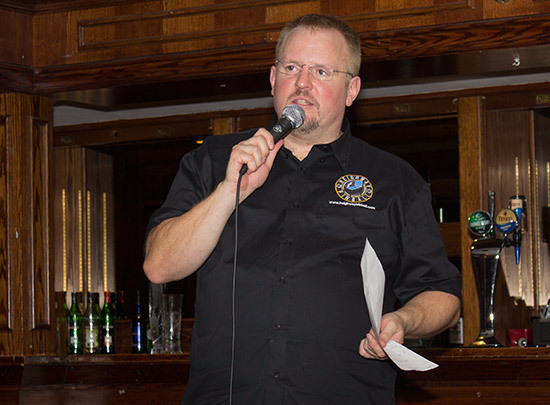 This year, the magazine's Editor, Jonathan Joosten, was back with the second issue and he spoke briefly to the dinner guests about what's in the new edition. 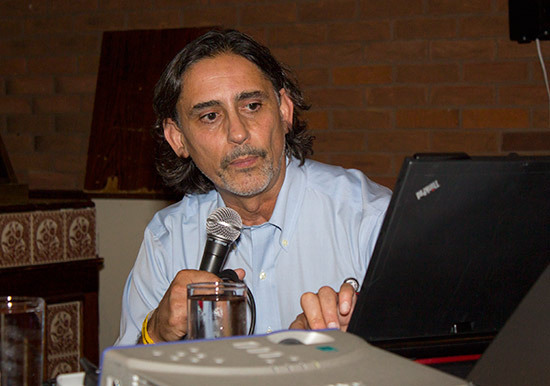 Then it was time for the show's special guest, George Gomez to give his talk and slideshow presentation. 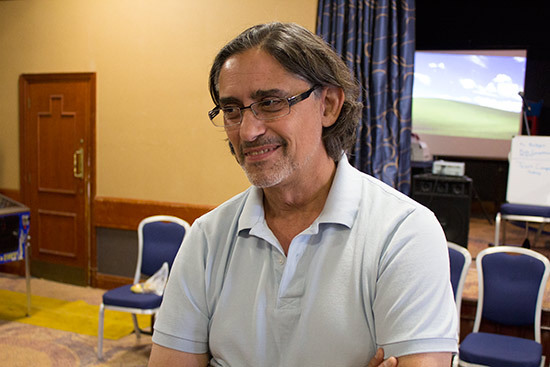 He began with some historical images from an article about Harry Williams, before moving on to his own career starting at Midway where he created the Tron and Spy Hunter games. 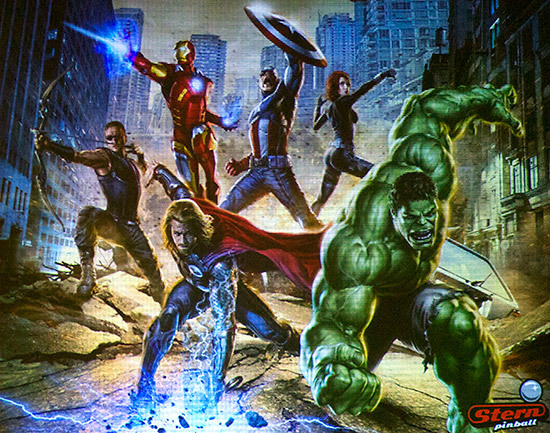 After showing some promotional videos based on Spy Hunter and talking about how he creates his designs starting with his initial sketches, George spoke about his most recent creation, The Avengers. 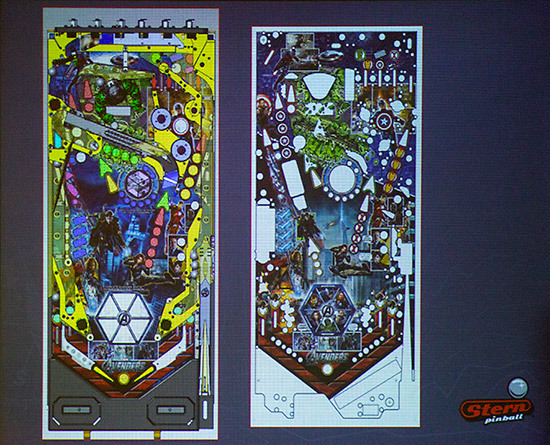 He showed the original playfield layout and contrasted it the final design, showing how the underground Loki ball lock on the LE and Premium models had to be removed because it would take too long to write different rules for the LE and the Pro versions. A similar idea was later implemented in Metallica LE and Premium. 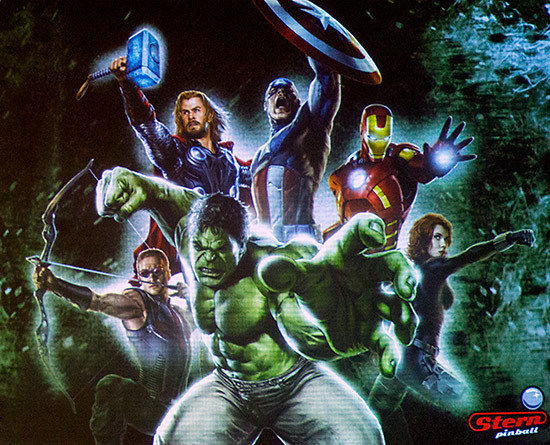 George also showed a number of alternative backglass and translite designs for The Avengers. You can hear George's talk for yourself using the player below. Many thanks to Gary Flower of the Pingame Journal for the audio recording. 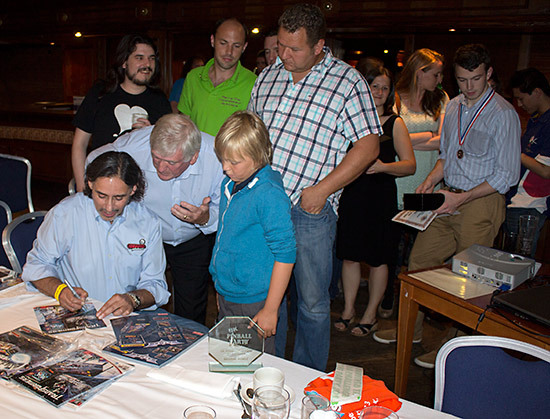 George's talk brought the awards dinner to a close, but he stayed behind to sign flyers, translites and other assorted pinball items. 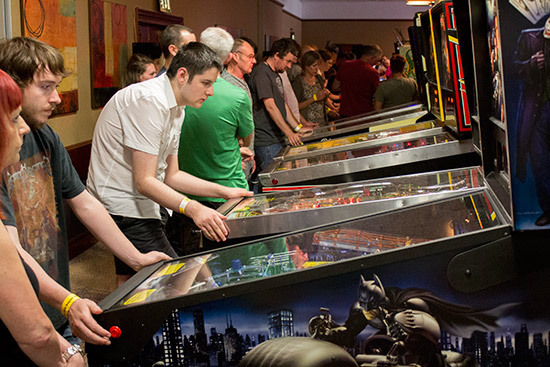 With the dinner finishing after midnight, some guests retired for the night, some made their way to the show hall for an impromptu late night pinball session, while others went way upstairs to the Fuel Bar to continue socialising into the small hours of the morning. 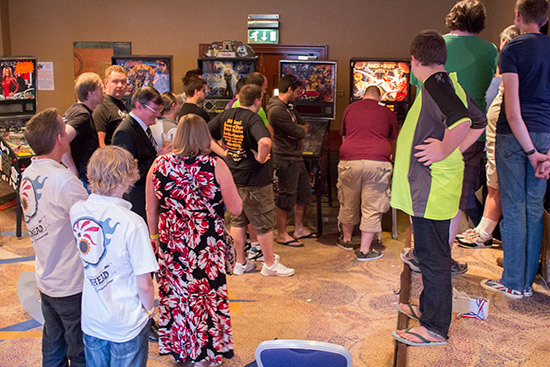 The final day brought a new set of competitive events at the UK Pinball Party. 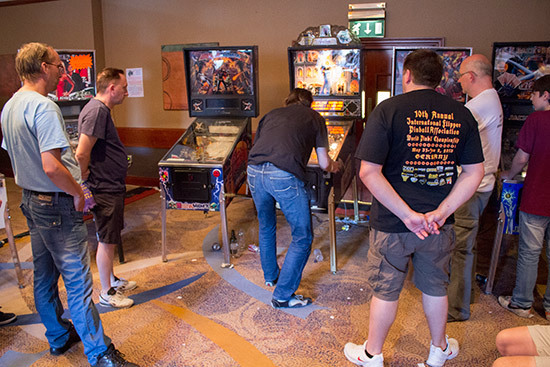 The main competition on Sunday was the UK Pinball Classic tournament where contestants had up to 15 attempts to get the highest score on any of the 8 machines set up in the tournament area. 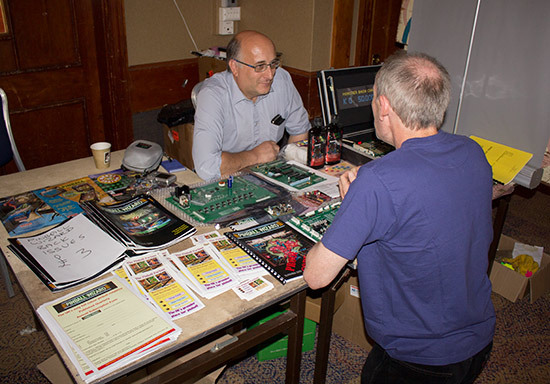 Each attempt cost £1 and 76 players took part. 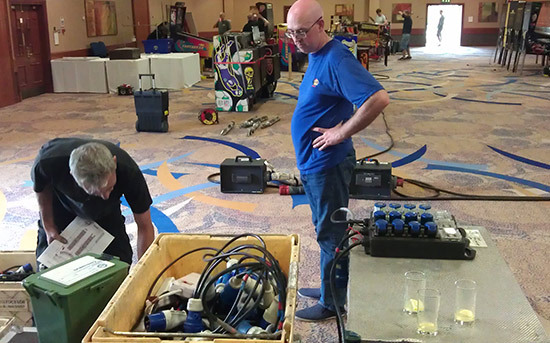 Qualifying continued until 3pm at which point the highest scorers on each machine went into the semi-finals. In the case of someone qualifying on more than one machine, they went through with the score with the greatest margin over the second placed player. The two semi-finals pitched Martin, Andy, Franck and William against each other on Devil's Dare, while Paul, Tim, Peter and David played on TX Sector. 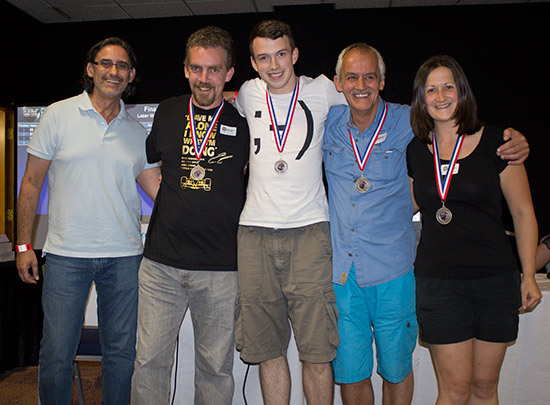 From these, Martin, Andy, Peter and David made it through to the final which was held on Hot Wheels. Peter Blakemore was triumphant, taking a clear lead with his 295K score. 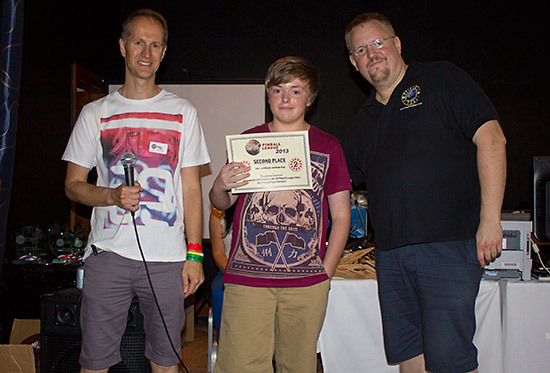 Martin's player one score of 181K stood up to claim second place. Andy was close behind on 155K, and not far behind him was David on 122K. 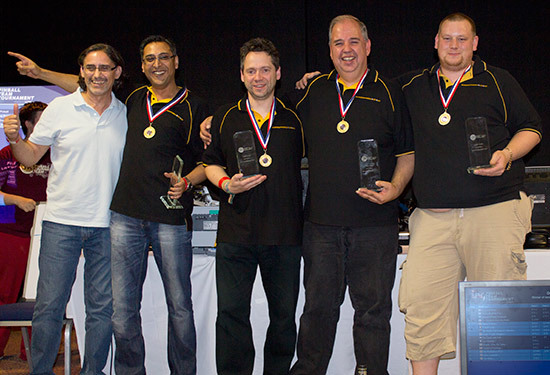 Straight after the final, the trophies and cash prizes were awarded by Jonathan Joosten. Sunday brought a second Kids Tournament, and on this day it was played on the colourful Cirqus Voltaire machine. Although Sunday is generally a slightly quieter day at the show than Saturday, the Kids Tournament proved to be even more popular on Sunday, with 14 youngsters competing for the trophies and medals. Once again, entry cost 50p. 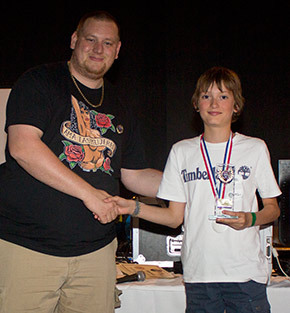 When clock reached 3pm, it was Lewis Fryars - whose 28M score remained unassailable - who took first place. Paul Baffault was second on 18M and Tim Raison third on 15M. 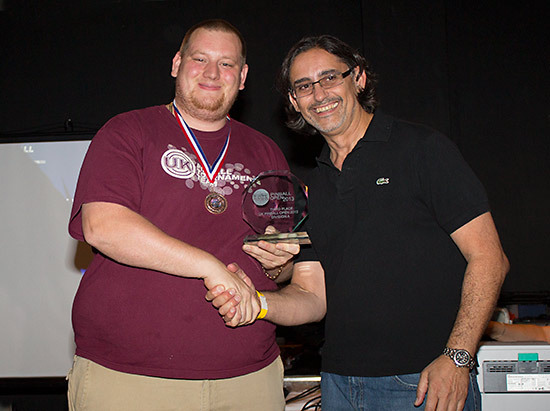 The awards were presented by Matt Vince. 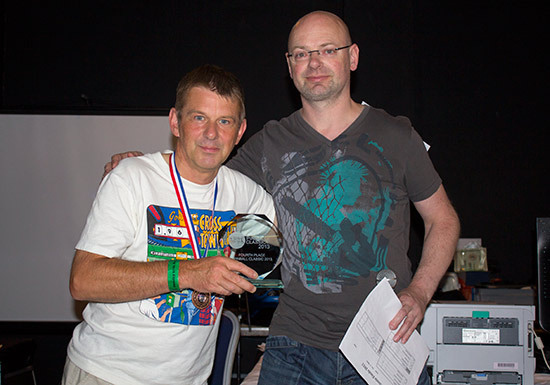 Running alongside the Classic and the Kids Tournament was the national final of the UK Pinball League. 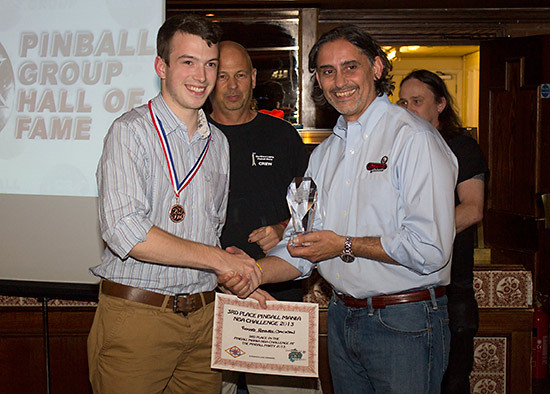 The League has five regional divisions, and the best players from each of them came together for this culmination of the League's 2013 season. 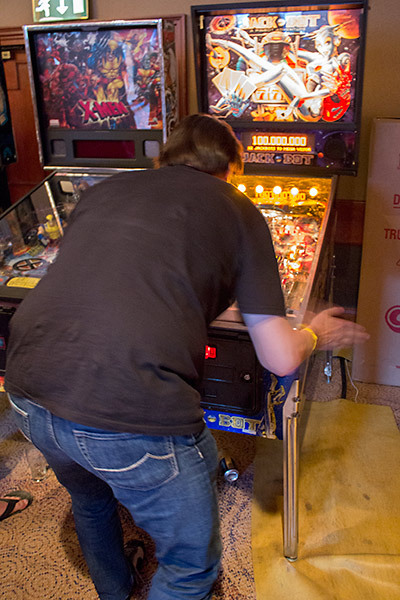 The final was played on five machines - Goldeneye, Family Guy, Jackbot, World Cup Soccer and X-Men Pro - and players had a single 4-ball game on each of them. All scores on each machine were ranked and points were awarded. The total points across all five games gave a player their total score. 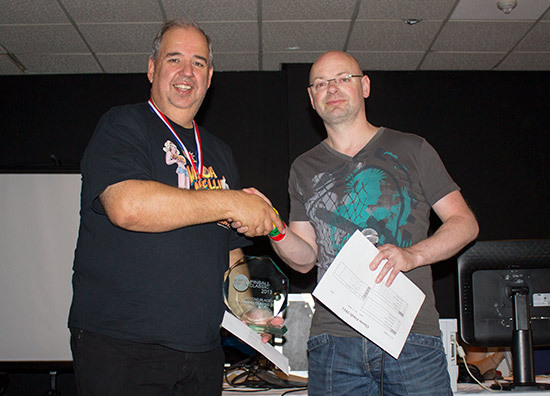 The winner of the UK Pinball League final was Martyn Raison with a score of 78 out of a possible 100 points. 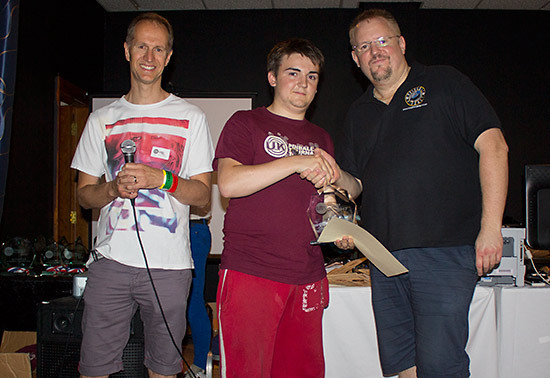 Second place was a tie between League organiser Greg Mott and Matt Vince, who both had the same 74 points. 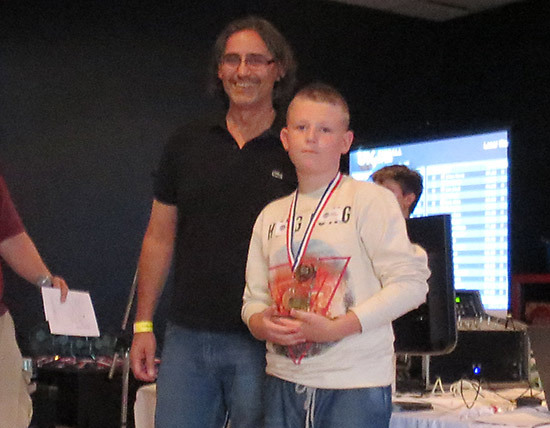 In fourth was Adrian Donati on 72 points. 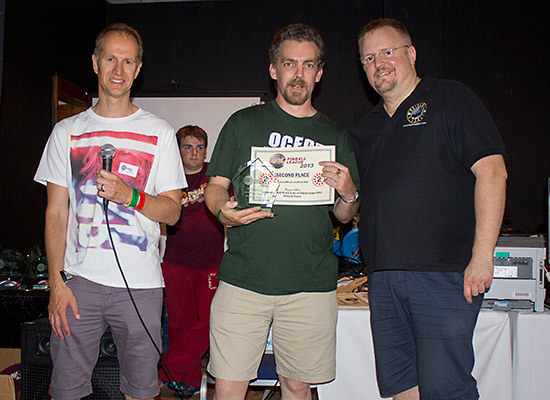 The awards were presented by Greg and Andrew. 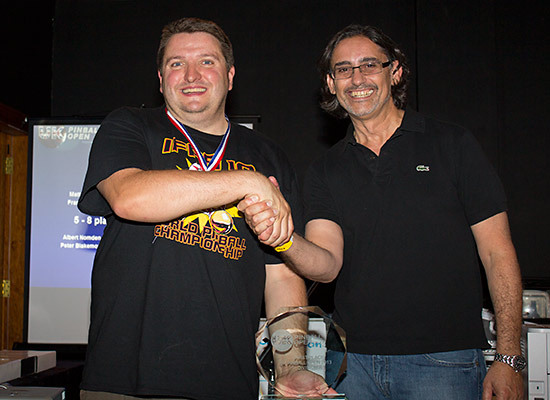 Prizes were also awarded to the top players in each of the UK Pinball League's regions. 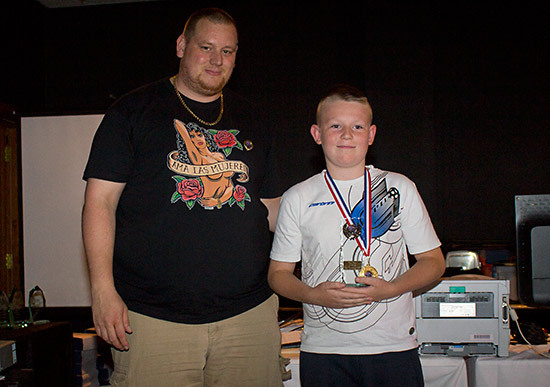 Not all of them could be at the show, but most were there to pick up their trophies and certificates. Third place went to John Higgins and fourth place to John Bud. 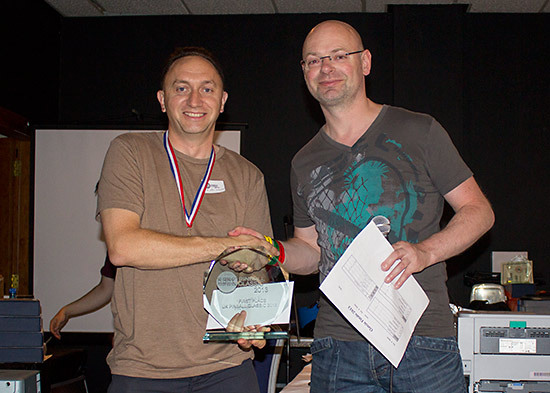 The winner of the Midlands Region was Nick Marshall who was not present to collect his award. 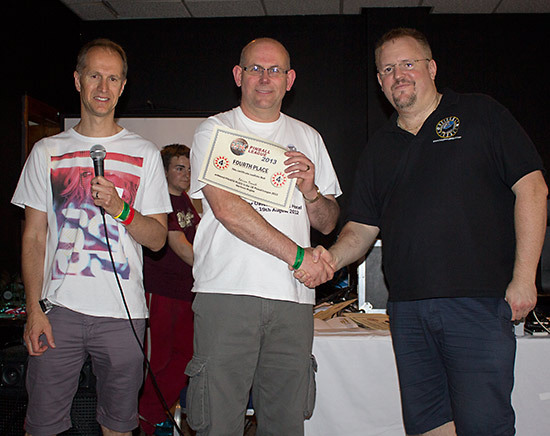 Fourth place went to Phil Dixon. 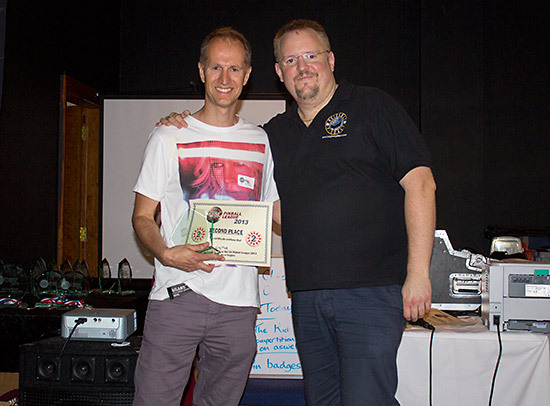 The winner of the South West Region was Craig Pullen who was not present to collect his award. 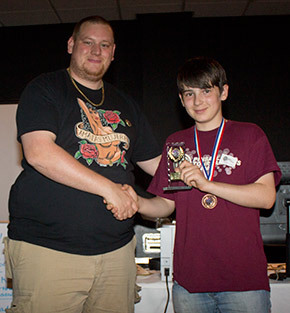 Fourth place went to Graham Rowley. 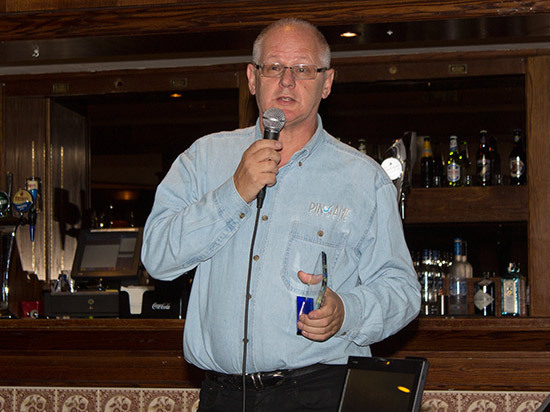 Fourth place went to Stan Simpson. 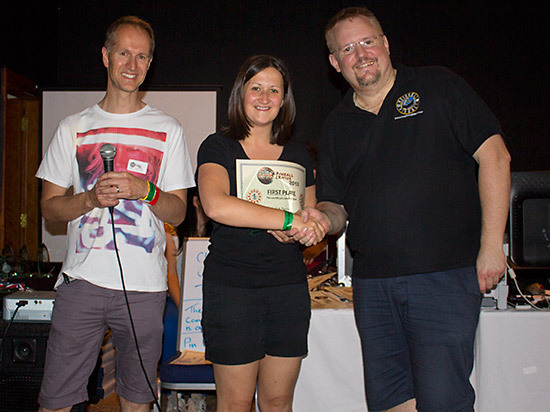 With all the trophies, certificates and medals awarded, the show slowly began to wind down. Stands were packed away and machines folded up for the journey home. It wasn't long before the hall was nearly empty. 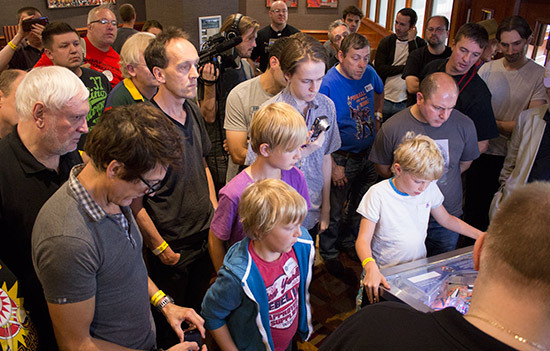 Comments both during and after the show suggested this was one of the best received UK Pinball Party shows to date. The lower outside temperature compared to last year and the extra chiller units meant the temperature in the hall remained comfortable throughout. 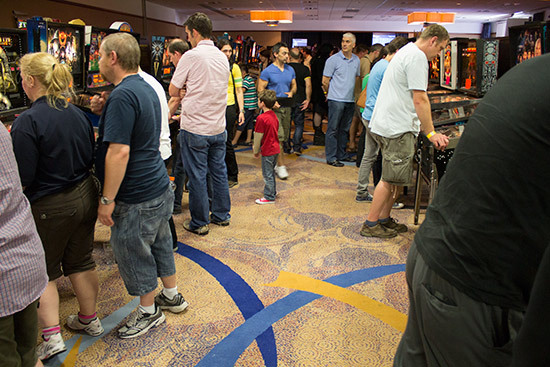 The good variety of machines meant everyone had the opportunity to enjoy some less-common games as well as the classics and the very newest titles, while the number of vendors provided guests with plenty of opportunities to stock up on pinball parts without incurring postage costs. 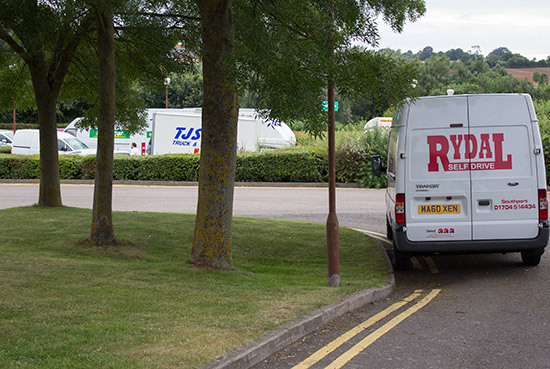 Everyone generally seemed more relaxed this year too; a sign that the show has achieved a level of maturity where those involved in organising the various parts know what is required, and the resources needed to achieve it. 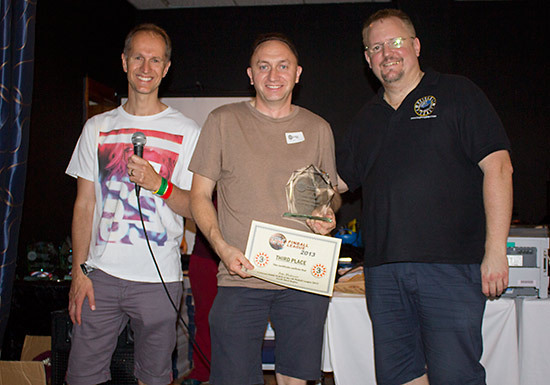 So a big thanks to everyone involved, those who brought games, those who organised the many competitive events, to Andrew Heighway, and to our special guest George Gomez for flying in just for the show. 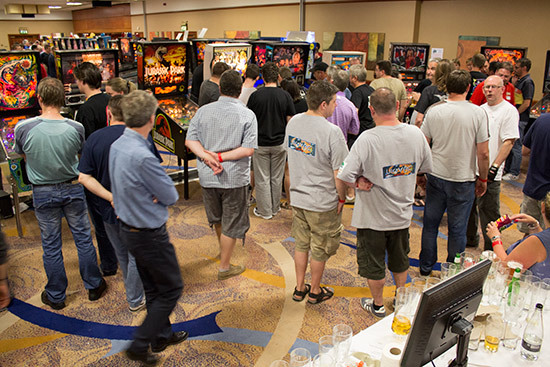 The UK Pinball Party will be back in 2014 at around the same time of year, and we'll be there to bring you all the action once again.